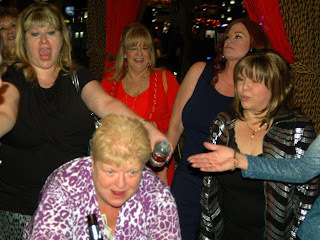 LAS VEGAS DAZE: Valentine's Day and a 60th Birthday Vegas Style! Valentine's Day and a 60th Birthday Vegas Style! The first Vegas trip of 2013 had Randy and I flying out of the San Jose Airport on Valentine's Day. 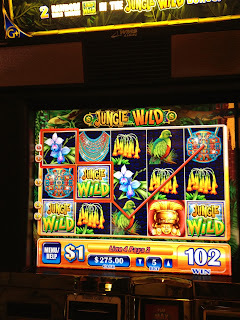 This was the start of a seven night trip for me and only two nights for my husband who was joining me to celebrate Valentine's Day and meet some of my friends. 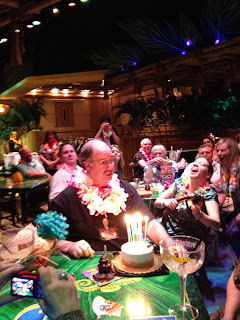 While Randy had to return home on Saturday I was staying over to celebrate Lowrance's 60th birthday with 85 other party attendee's! Due to the length of this trip I'll be breaking this trip report up into two parts with the first part being my three nights at Palazzo and the second part, three nights at Wynn and last night at Aria. 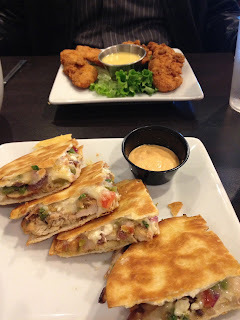 Before we left on our flight we had a quick stop for some food at the Ruby Tuesday's inside terminal B of San Jose Airport. Randy had chicken fingers and I had some chicken avocado quesadilla's both of which were good though I think our server thought I was nuts when I only ate the insides of the quesadilla and left the really tasty fried part alone. The flight to Vegas was full and a short 65 minutes, but we had to circle around to wait for the airport to let us land so our flight ended up being late. 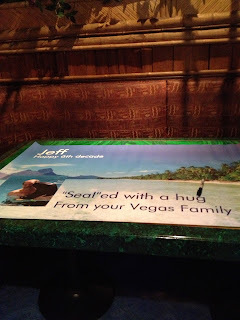 Once we landed at McCarran we were met at baggage claim by our Palazzo limo driver and were soon on our way. Once at Palazzo we were quickly checked it by the VIP lounge clerk and off to our room on the 43rd floor to unpack. 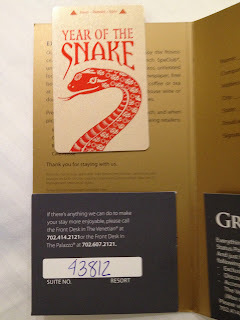 This visit the VIP key cards were a totally different design from the regular key cards that usually only have a band of silver or gold at one end to indicate access to the VIP lounge. 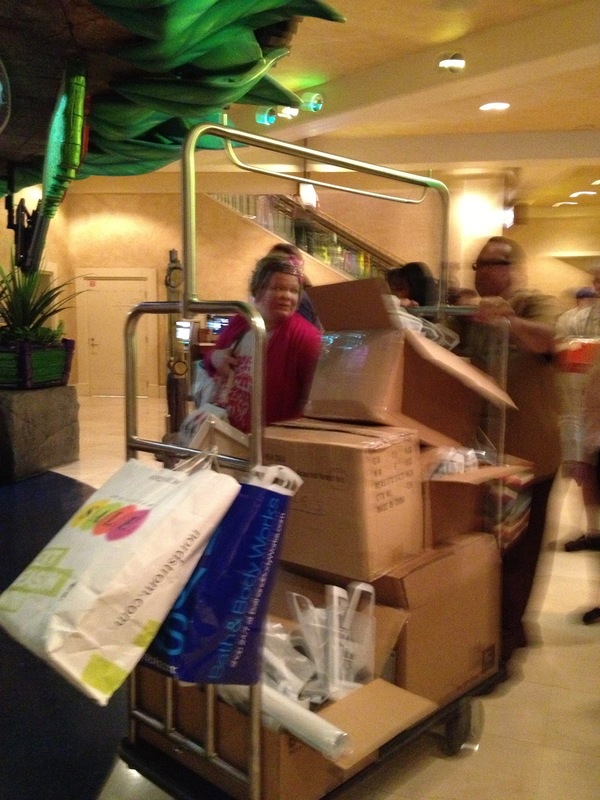 After unpacking we headed off to the Venetian to pick up the tickets our host had comped for Rock of Ages which we were going to see that evening. 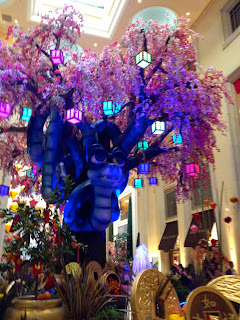 On the way to the Box Office we saw our first glimpsed of the Year of the Snake display at the Palazzo waterfall area. The head and eyes move on the snake and I thought it was cute. 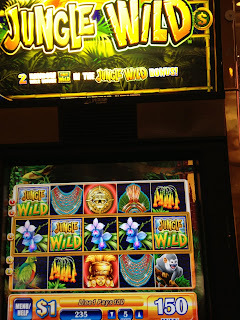 After picking up our Rock of Ages tickets it was time to get our gamble on before dinner and the show and I thought it was going to be a lucky trip for us when my first spin on $1 Jungle Wild hit for $150.00! 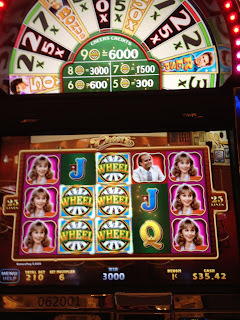 Our luck continued when we played Clue at Palazzo and even though I picked poorly except for the last one it was a decent win at $138.75. 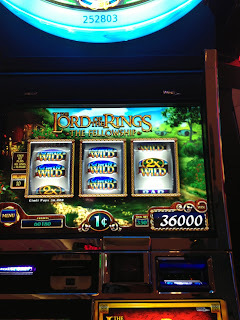 We then tried to repeat our success of last year with Lord of the Rings and had some promising hits and activity on the 3 machines at Palazzo. 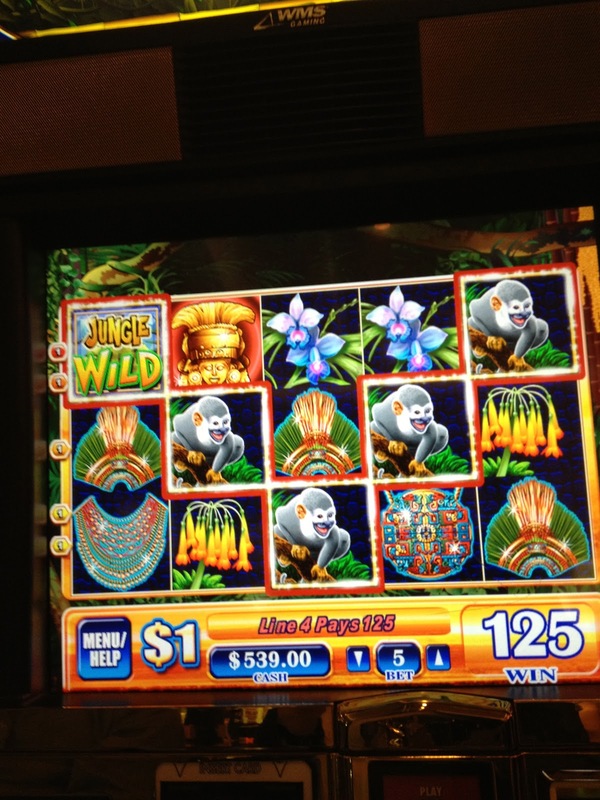 Since we were winning I left Randy to continue to gamble and went to meet Emmas from the Slot Fanatics and Slot Machine forums! 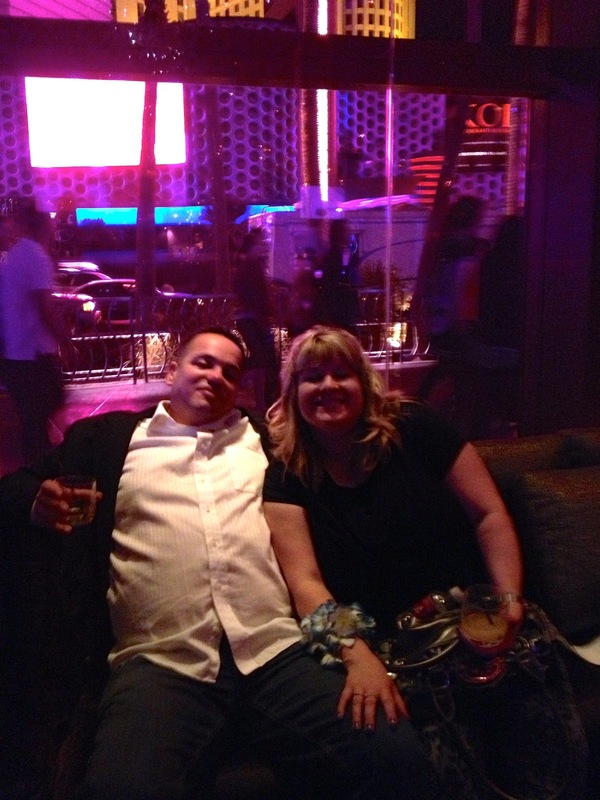 I had a great time with Emma chatting about where we both live and of course Vegas. 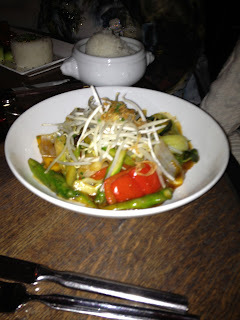 I was sorry when we had to say goodbye because of our dinner and show plans. During the time Emma and I were having fun chatting and drinking our cappuccino's Randy was losing, so he briefly joined us in Palazzo's Platinum Lounge for a drink. 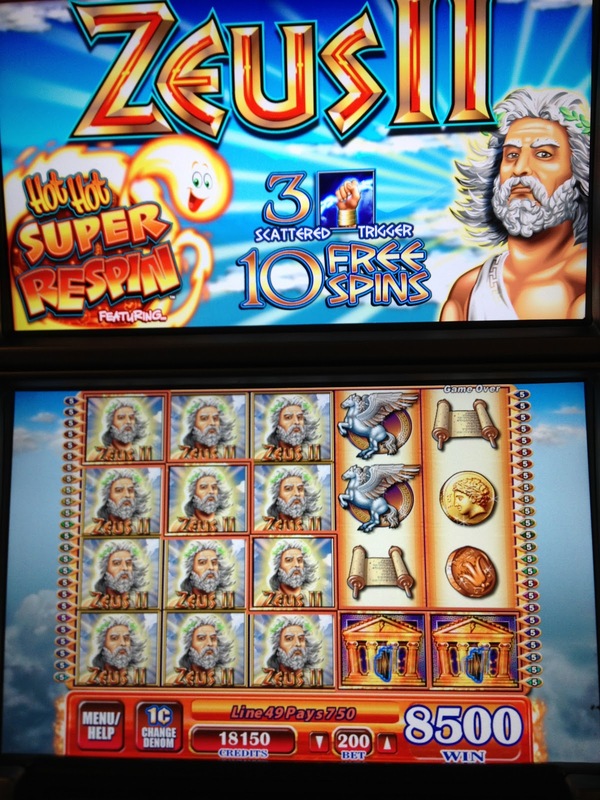 As Randy and I left the Platinum lounge we briefly played some slots as we walked toward Cut but except for this hit on $1 Zeus we just lost so we were happy to leave the high limit area of Palazzo and head off to our dinner. While walking to Cut I discovered I had just missed seeing Human Nature giving a brief free performance in the Palazzo Waterfall Atrium area. They still had the photographers and video cameras set up as we entered but no sign of the guys. 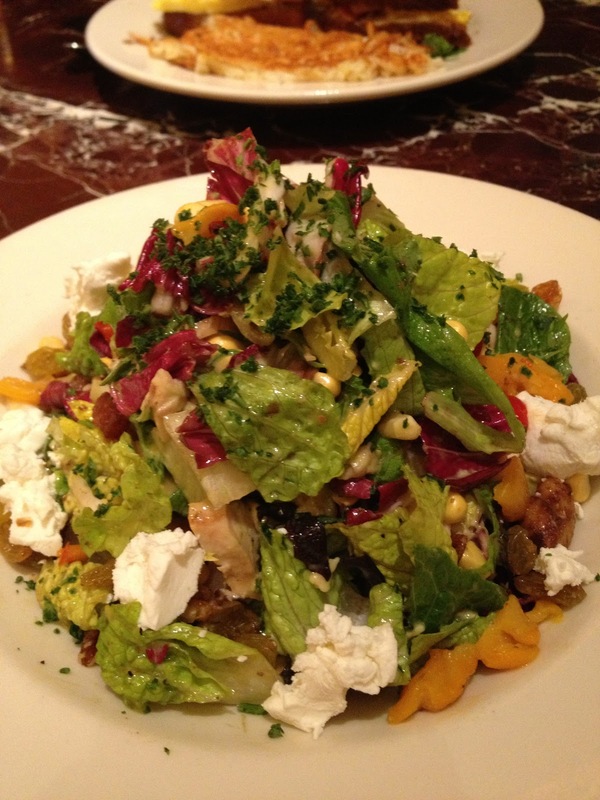 At Cut we were quickly seated at our favorite booth and I ordered Monroe's Passion which quickly became my passion as I ended up having two of them! 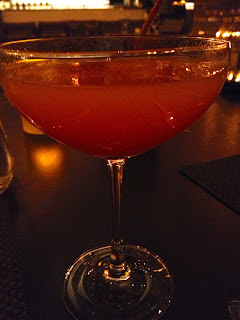 This is a spicy cocktail with ginger and chili's. Cut's yummy parmesan bread stick and their amuse which is aways this cheese puff. 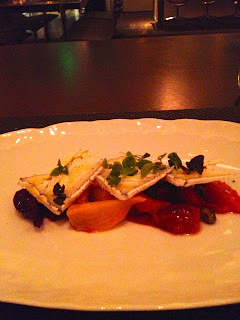 Baby Beet Salad with Point Reyes Blue Cheese, pistachios and micro greens. I've had this before and always enjoy it! 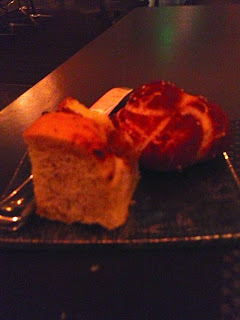 Best focaccia and pretzel bread on the strip in my opinion! 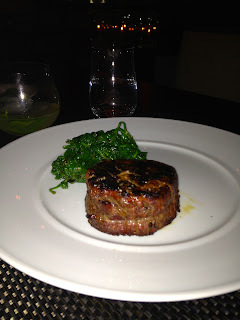 Randy and I split a filet of tenderloin, a whole lobster and side of spinach. Everything was delicious and our filet is always good perfectly the way we like it at Cut! 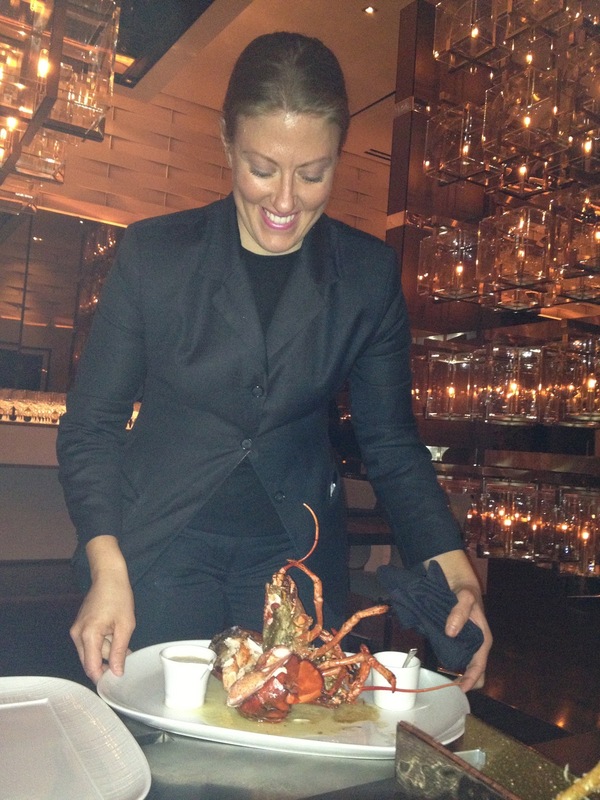 One of our servers presenting the lobster before she removes all of it from the shell and divides it for us. I've never had anything but great service from the staff at Cut and this time was no different. Of course we had to have the chocolate soufflé on Valentine's Day. 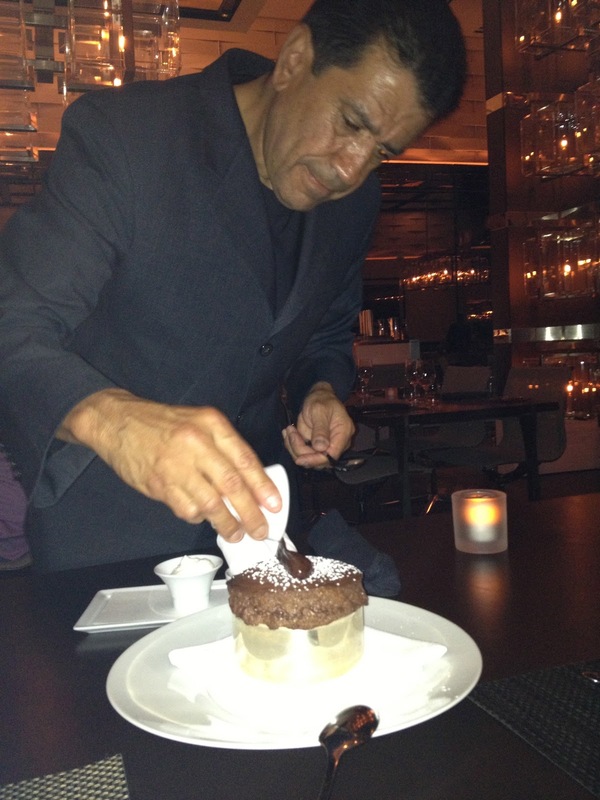 Love this soufflé, if for some reason you can't dine at Cut at least stop into their lounge and order the chocolate soufflé for dessert! 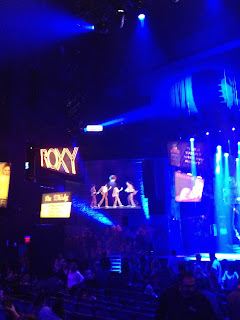 We enjoyed Rock of Ages, I thought the cast did a great job and it was quite different from the movie with Tom Cruise. Because I had requested our host change our tickets from Saturday evening to Valentine's Day we lost our 4th row seats and ended up in the last row of the yellow section in the center and in front of the sound booth. The seats here were portable ones with arm rests that they have brought in and not only were they comfortable in my opinion and had more space between then the regular theatre seats, you could move them back since there wasn't a row behind us, with the result we had plenty of leg room. 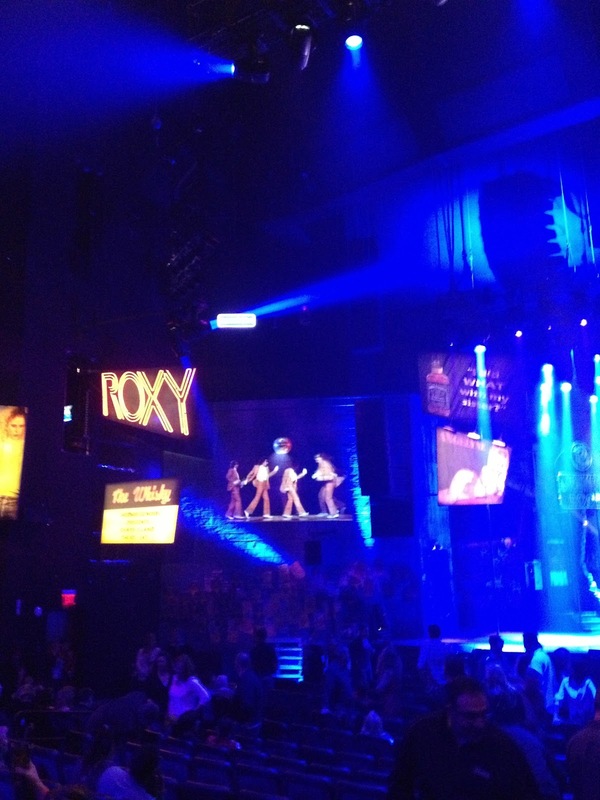 We had a great view of the stage and after the show it was easy to just move the chair and leave. I would actually take these seats again instead of ones closer to the stage! After seeing Rock of Ages we returned briefly to the Platinum lounge to drink some ice tea and encountered a very nice lady who reads this blog. Betty, it was great to meet you, hope to run into you again in the future and have more of a chance to chat! 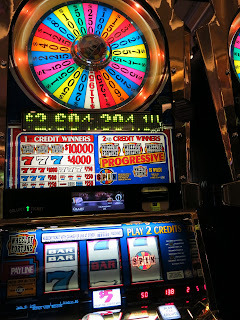 Randy and I were having a great Valentine's Day celebration but the birthday events were already happening before we got to Vegas and also some tonight and I heard we missed some great parties! There was so much going on this week that for some of us it was just impossible to make everything! 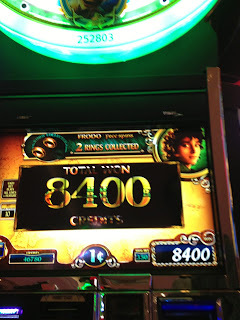 That night we gambled quite a bit but just lost. We tried the high limit quick hits and the above win was our best hit but it took that back and more. 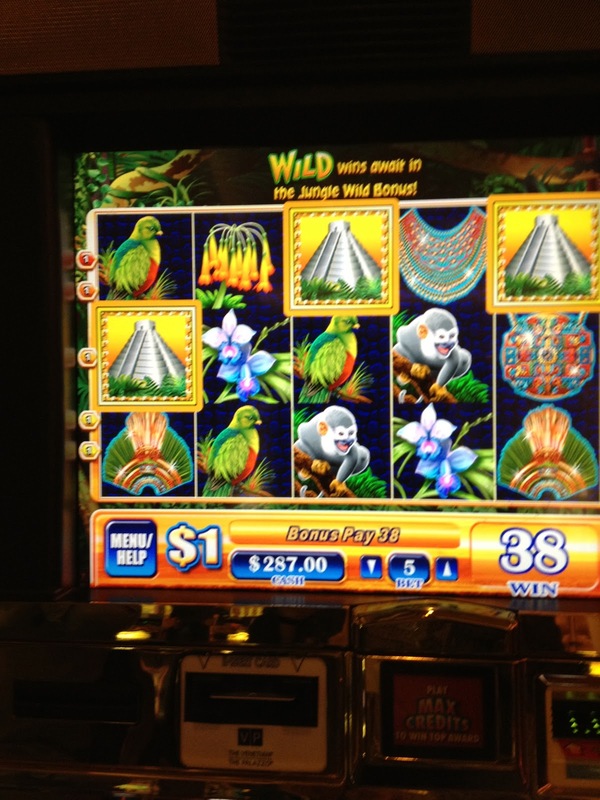 Later I ran into David another reader of my blog that I had met last July and found out that he was on a wonderful lucky streak and had taken about 4k out of this Quick Hit slot! 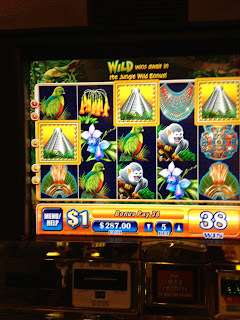 David hope you and your family had a wonderful time and one of these trips I hope we'll have more time to chat! 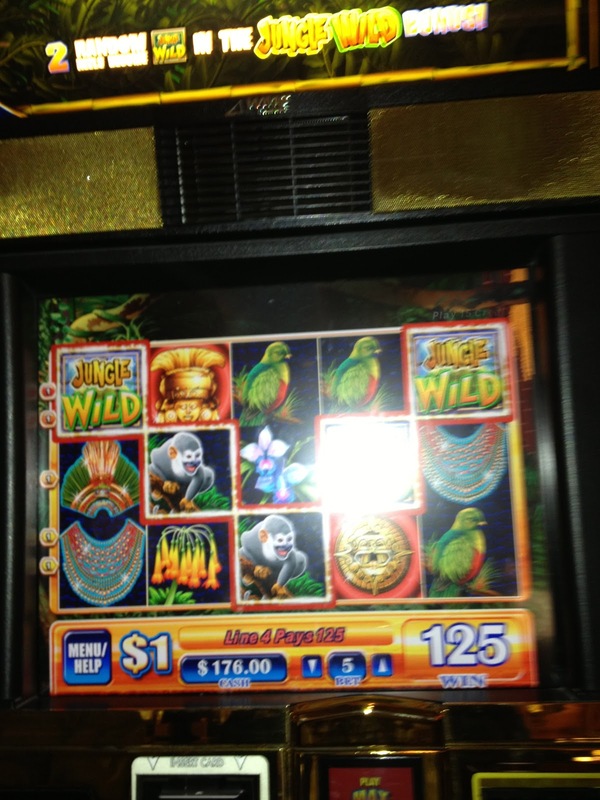 Since our luck was no where to be found and it wasn't for lack of trying to find it, we hit the penny slots. 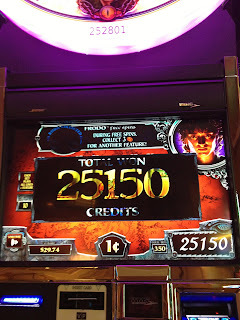 I found the new Cheer's slot at Venetian to be disappointing, but then we were on a unlucky streak so perhaps it's too early to make a judgement on this slot. 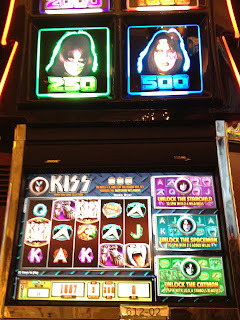 Tried the new Kiss slot and again no luck and what seemed to be low wins. 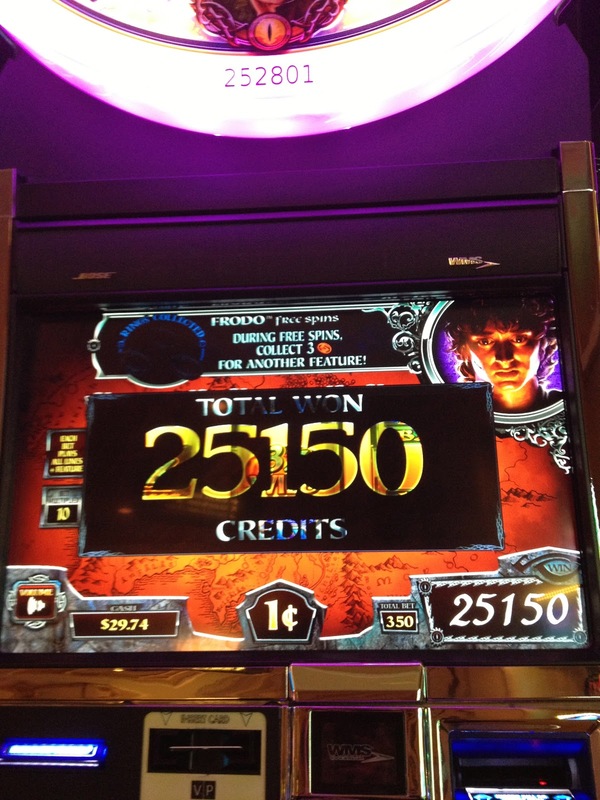 I still love the Michael Jackson slot but it seldom wants to bonus for me any more. Yes, we returned to Lord of the Rings and had some nice hits on it. 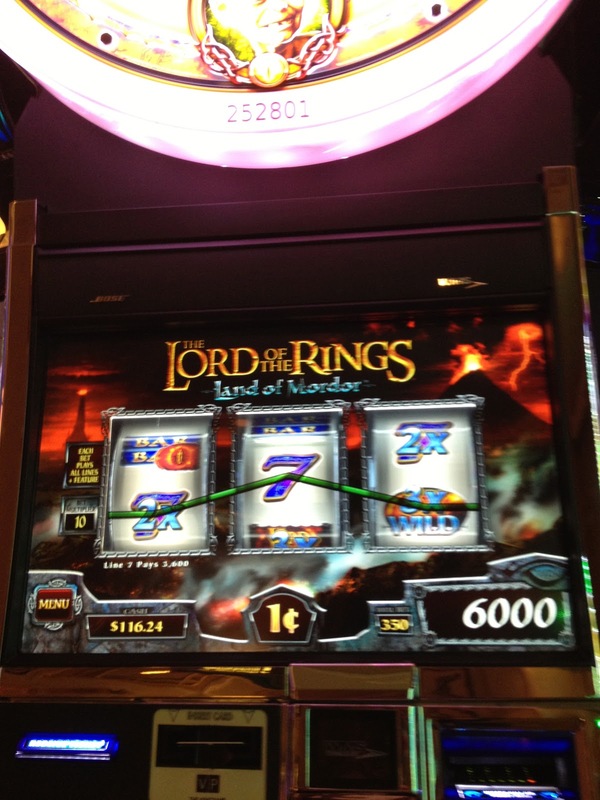 I know it looks like we are winning but LOTR couldn't save us, we had fun briefly on it, but we were still losing. 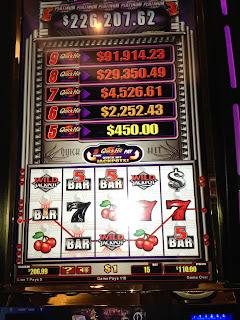 During our play this night we hit quite a few bonuses that paid us zero!!! 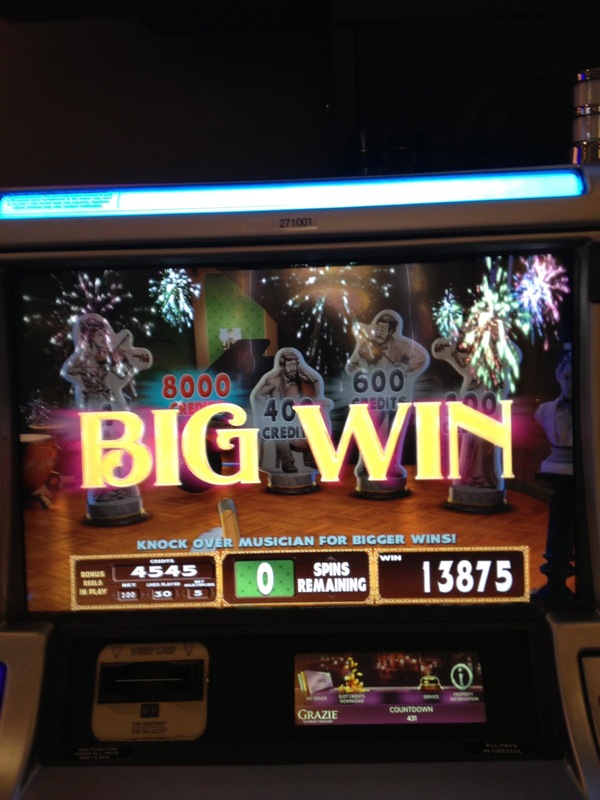 So disappointing to finally get a bonus and not have it pay anything. 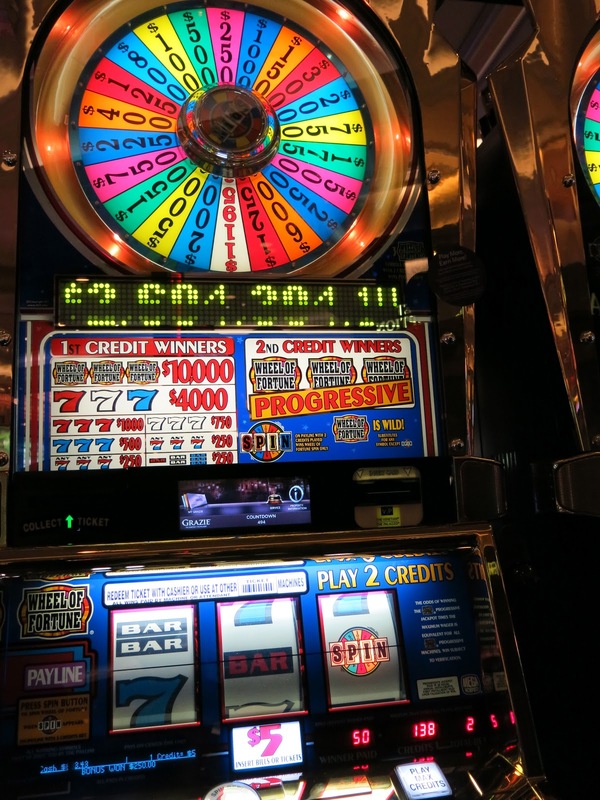 It's my opinion that all slot bonuses when you hit one should give you a default or consolation prize equal at least equal to the amount bet, if not double the bet. 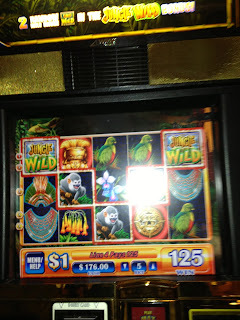 Good example above of how sour our luck had gone was when we finally hit a bonus on $1 Jungle Wild and the win if you could even call it a win was $12.00!! 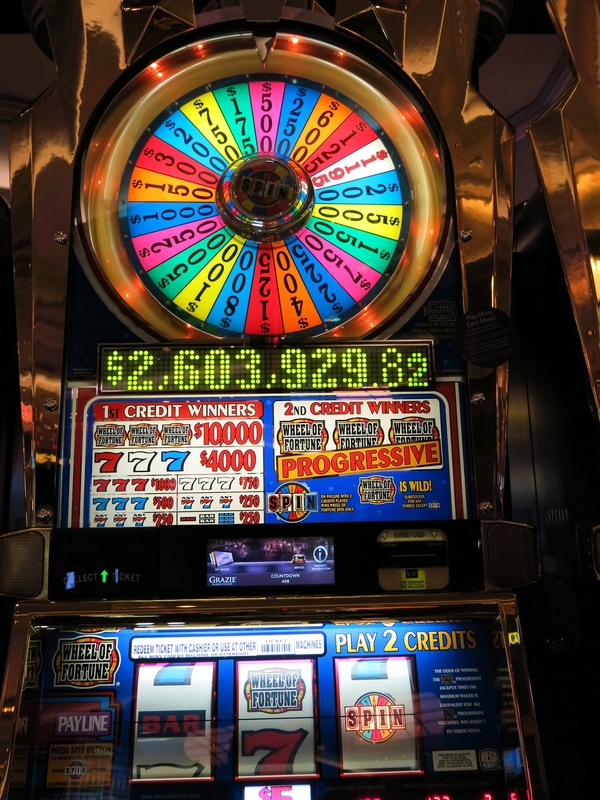 The penny Wheel of Fortune briefly gave us a brief thrill. 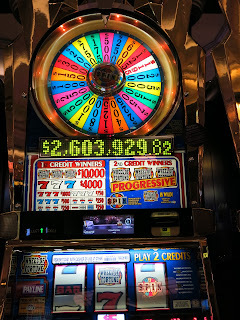 We finally hit for $500 on the $5 Wheel of Fortune and this $500 was the largest hit of my trip! The Aladdin slot at Palazzo finally gave us a bonus! 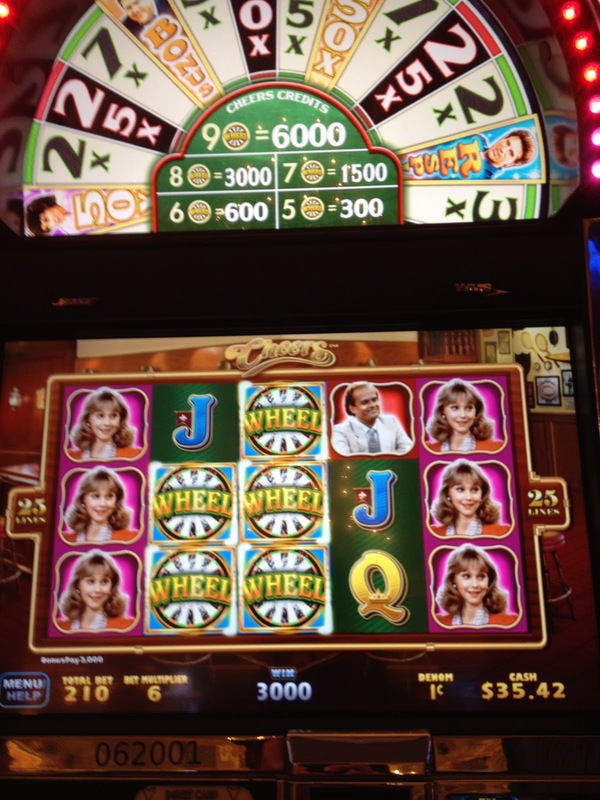 We returned to $5 Wheel of Fortune and hit a spin again, but between these hits the pennies were killing us. Okay, actually everything was taking our bank roll down. 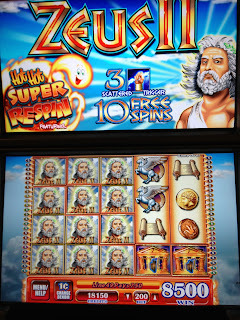 We left Palazzo and went to Venetian to play the original WOZ slot which gave us a few nice bonuses. 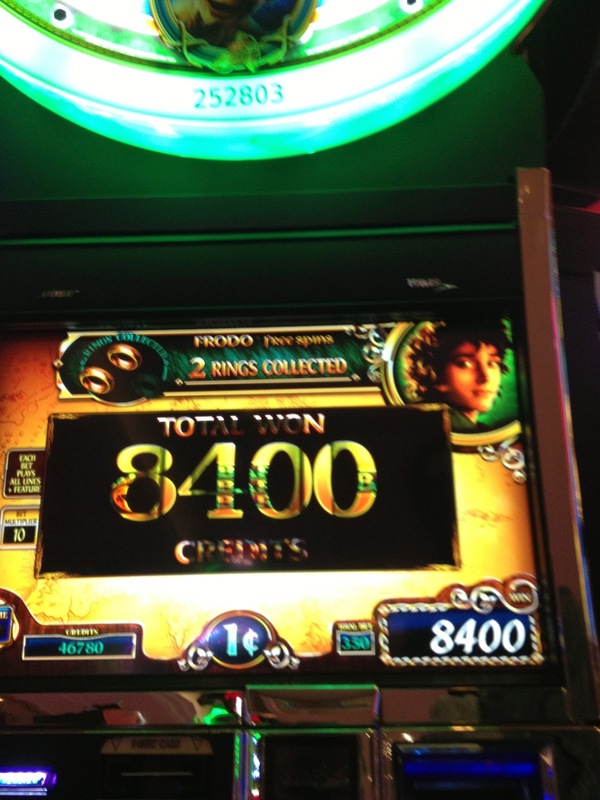 Stop the presses I actually had some good picks during the Emerald city bonus instead of my usual first emerald pick being the Emerald city! When we went to bed that evening we were losers but it had still been a fun Valentine's Day and I was hopeful that our luck would change. 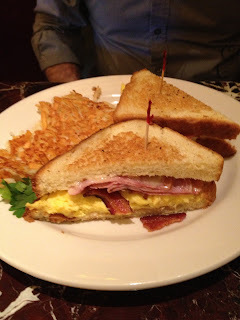 We slept in on Friday and then went to Palazzo's Grand Lux where Randy had his favorite, the egg sandwich and I had one of my favorites, the Sonoma Chicken Salad. 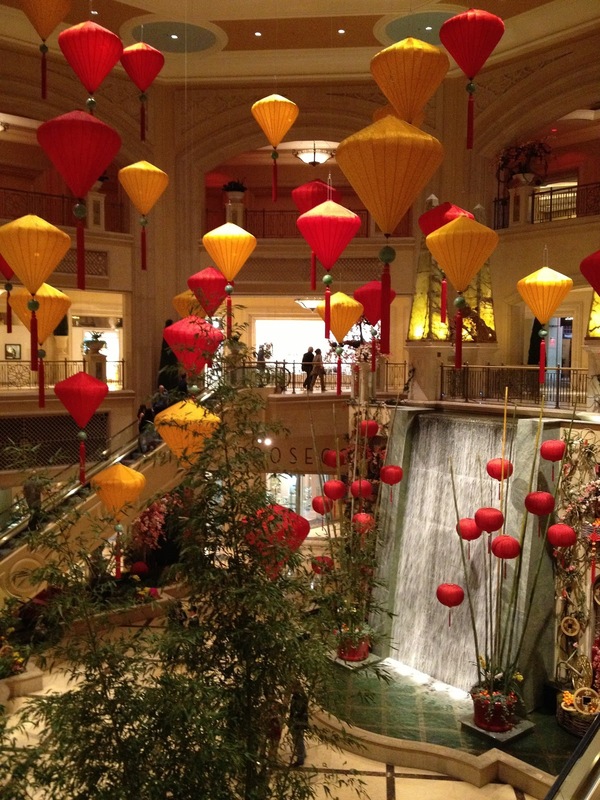 After eating Randy went off to get ready for his massage at Canyon Ranch Spa and I walked over to Wynn. I was walking to Wynn not to gamble, but because Friday afternoon was the day a group of us ladies were getting together in Gwen's room at Wynn to put together the goodie bags for the attendees of Lowrance's 60th birthday party! Teresa and Barb in Gwen's room as the ladies start to arrive. Teresa along with Gwen were the main party planners and their super organizational and craft skills created a fabulous party! 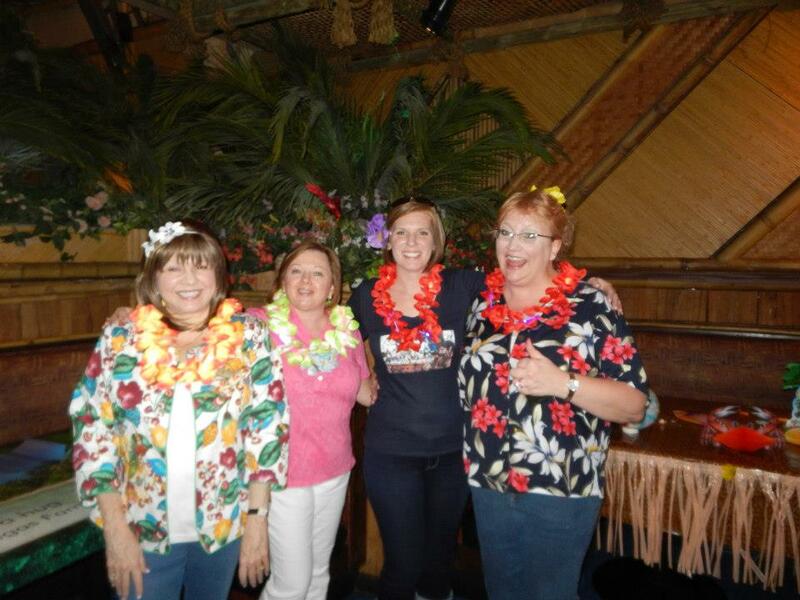 I can't even begin to describe the work and resources these ladies gave to make Lowrance's birthday party the special day it was! Teresa and Gwen, if I throw a party in the future I hope I'm lucky enough to have you two planning it! 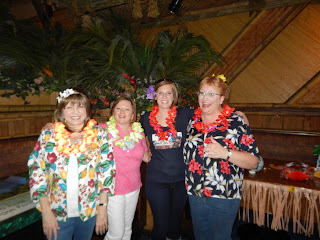 Barb was the main organizer for decorating the tables and private room at Kahunaville and also Lowrance and Roz's hotel suite. 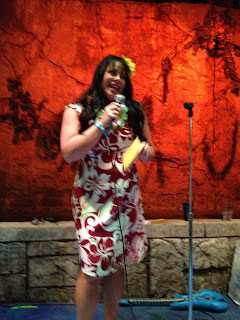 She had been buying up Hawaiian theme decorations for months before the party and did a wonderful job! When we arrived at Gwen's room we found that she had already done a lot of work sorting the majority of the gift items into groups. 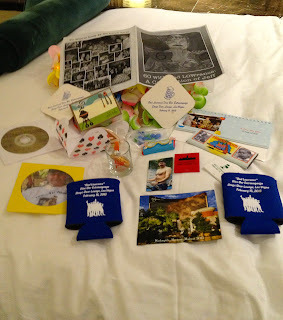 So many goodies, including a fabulous calendar full of fun photos of Lowrance called A-Low-Ha 2013 that Gwen had designed. In case we got hungry while working Teresa brought us incredibly delicious cup cakes from Retro Bakery! I had a yummy cupcake that had apple in it. Some of us were placing the liquor chocolates into the shot glasses that Roz had made for her husband's birthday which then went into the small boxes that Teresa had made by hand. Teresa's step daughter Jessica makes the cutest and most delicious cookies. 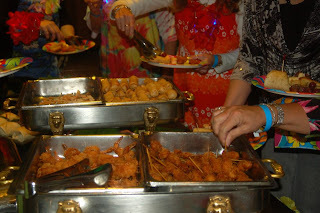 While she wasn't able to make the party she baked over 100 cookies shaped like T-Bone steaks which the ladies bagged into the cute bags and labels that Teresa had made up. Some of the finished gift bags! Most of the above items were in the gift bags with the exception of Harlemgirl's "Martooni Madness 2013" Wynn magnet photo, and the cute coasters and cup sleeves that said "Bad Lowrance dive bar extravaganza stage door lounge which fl-mermaid had made, these were given out at those parties which unfortunately I missed. After we finished with the gift bags the group headed out to get ready for dinner that evening. We had two different dinner events going on. 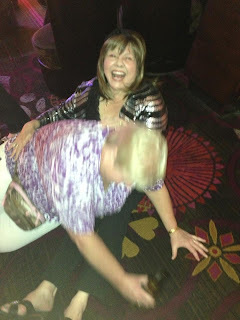 One group was going to Venetian's Rattle Can restaurant and I heard they had a blast with Lisa M even getting on the pickle! Liz, Manette (Clemi) and Vinette! 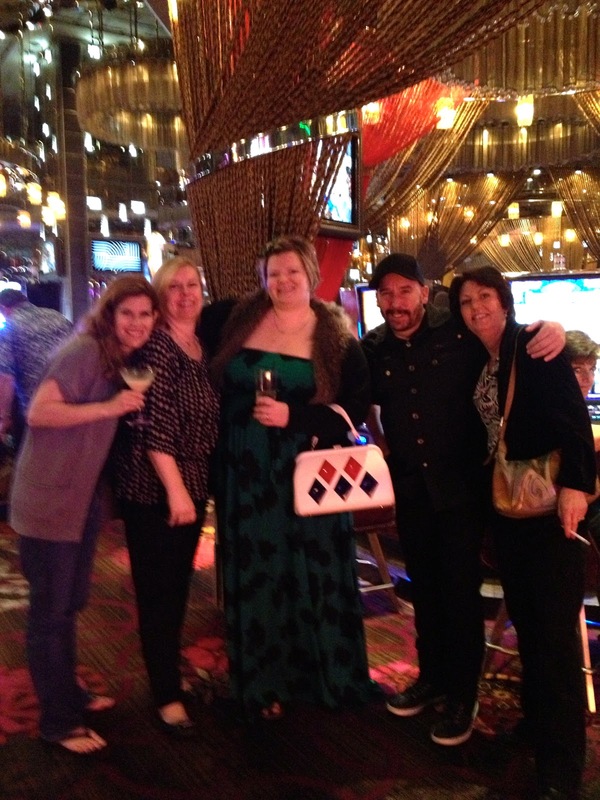 Lowrance, his wife Roz and Teresa at our table at Tao. Gwen's lovely Mom Claudia, myself, Gwen and my husband Randy. I knew what the two above appetizers were over a week ago but no longer. Take a guess! Above is the lobster and shrimp spring roll with pineapple sauce. Randy and I shared this, one of our favorites. 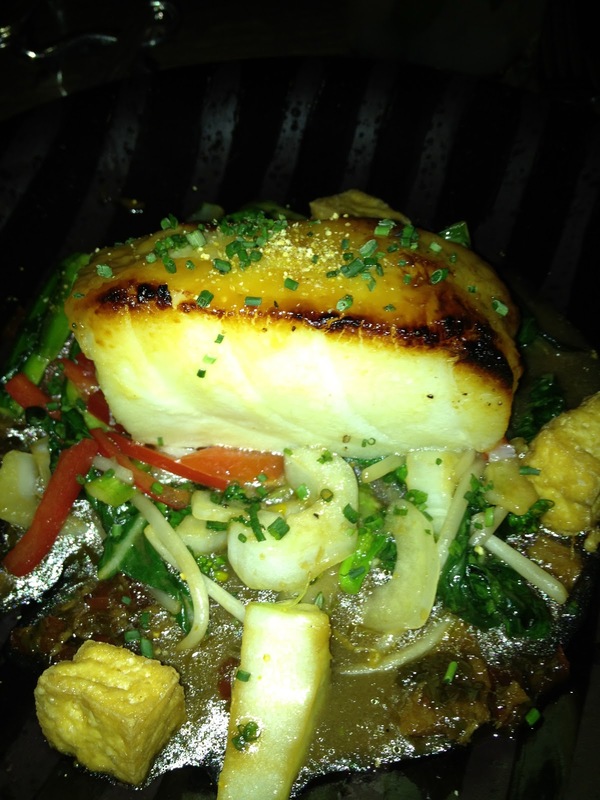 Several of us ordered the miso glazed sea bass with wok vegetables. If you've read a trip report from me in the past you know I love this dish and consider it one of the best entrees on the strip! 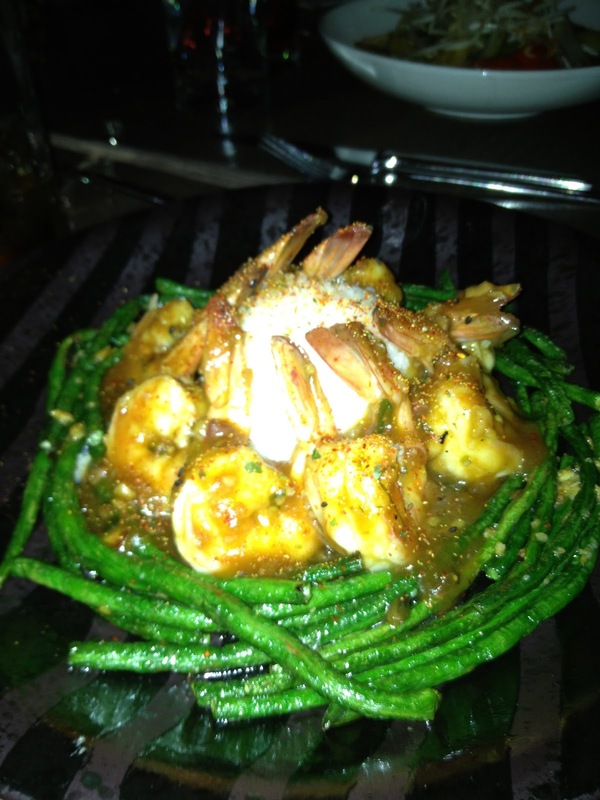 Hong Kong XO Shrimp with long beans and Jasmine rice. Sorry I can't recall what the entree below was. 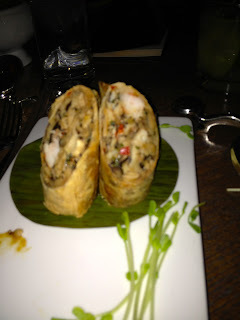 I know the Hong Kong XO Shrimp were good! 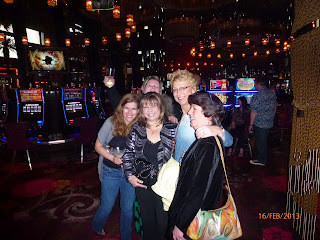 After dinner at Tao we walked to the Bourbon Bar to meet more of our party group who had dinner at Venetian's Rattle Can that evening. 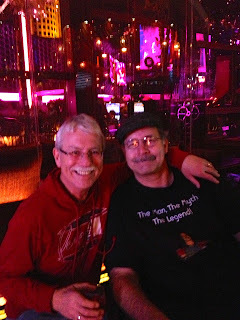 I didn't have a chance to chat for long with anyone since after introducing Randy around he was ready to go gamble and since he was leaving the next day I wanted to spend time with him. It ended up we should have stayed at Bourbon Bar with our friends! 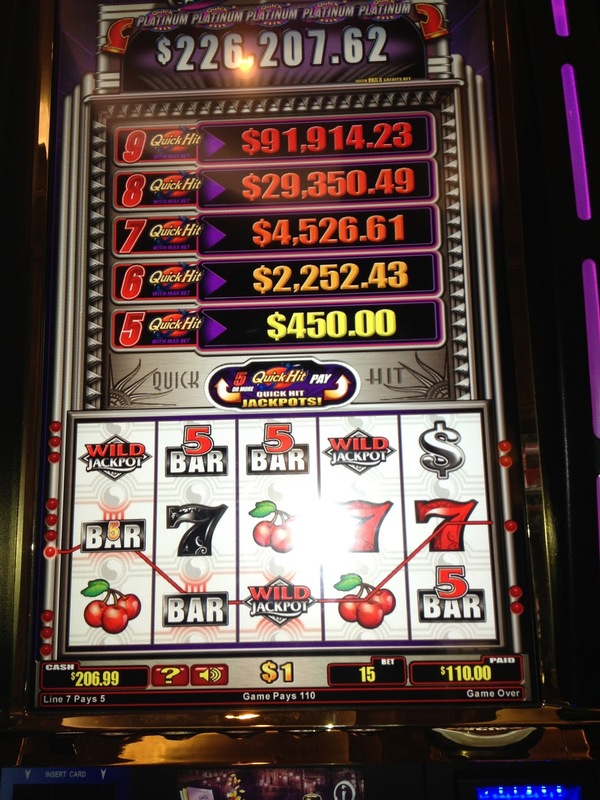 For every hit you see here we had ten times the losses! 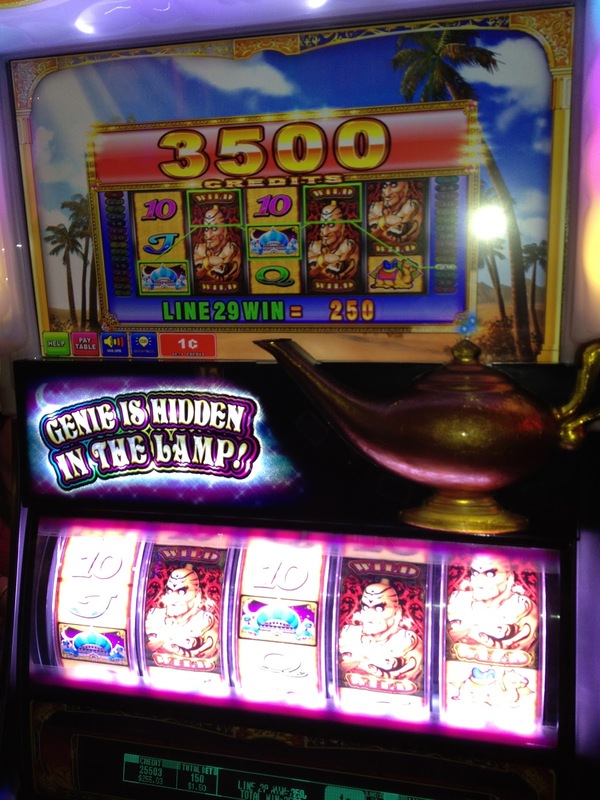 This version of Aladdin is cute and I know of others who have had winning streaks on it, but not us! Randy took this photo of me in front of the snake right before we walked around it 3 times for luck. 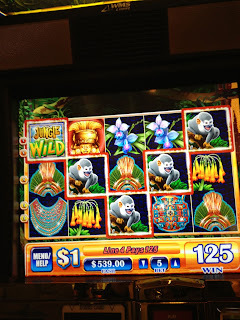 The walk seemed to help briefly and we had a few decent hits as you can see above we hit another disappointing bonus on $1 Jungle Wild where luck left us once again! 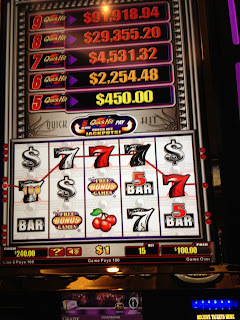 One more try at Quick Hits but alas this visit this slot only paid out for David! 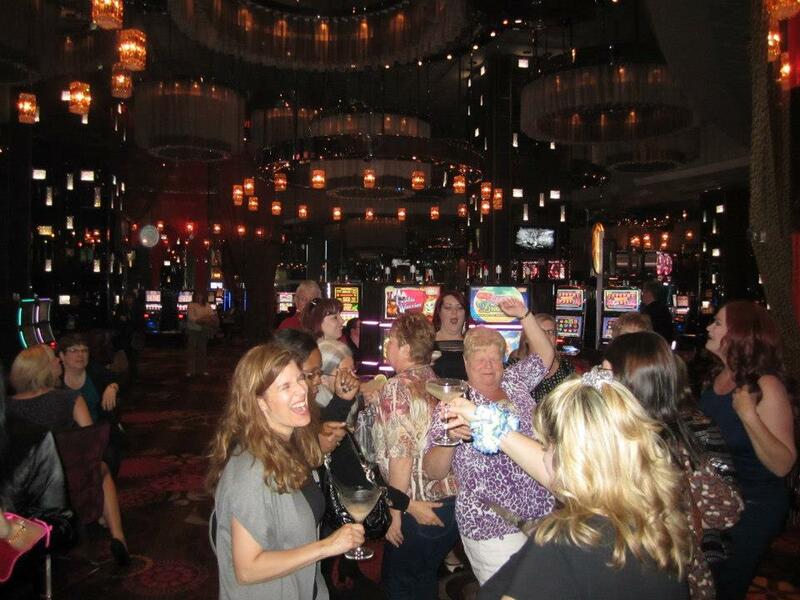 We were losing again so we went back to our room for a break and then upon returning to the casino we accidentally got off at the promenade level and instead of getting back on the elevator decided to walk down to the casino. 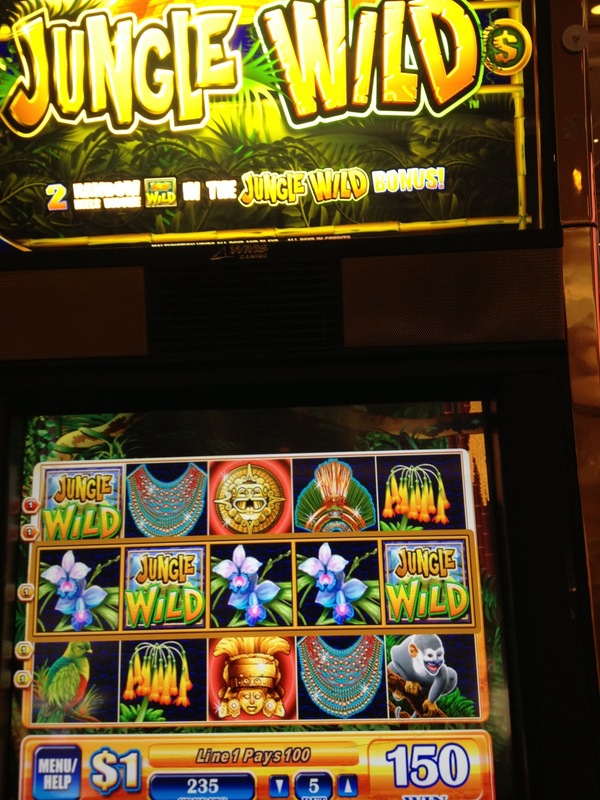 Of course we briefly got lost and at this point my husband turns to me and says, "we're such losers we can't even find the casino"! Sad but true, LOL! Next morning Randy and I ate at Grand Lux again and then said goodbye as he would be leaving in about 4 hours to catch his flight and it was time for me to walk over to Kahunaville and help the group who was setting up the decorations for the birthday party. 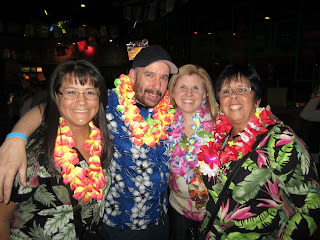 As I entered Treasure Island and approached Kahunaville I spied Gwen, Teresa, Claudia and Liz with a bell man who has a huge card of boxes full of decorations. 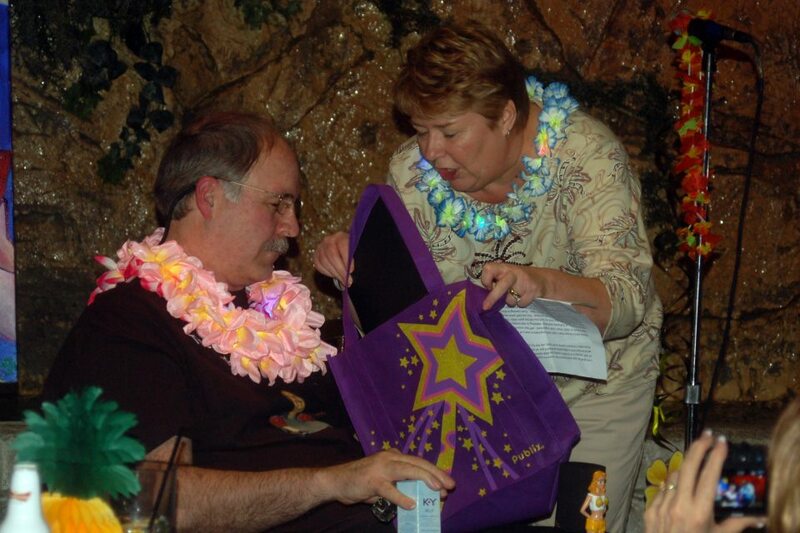 This was just part of the decorations as Barb and her husband Ger also had a lot. 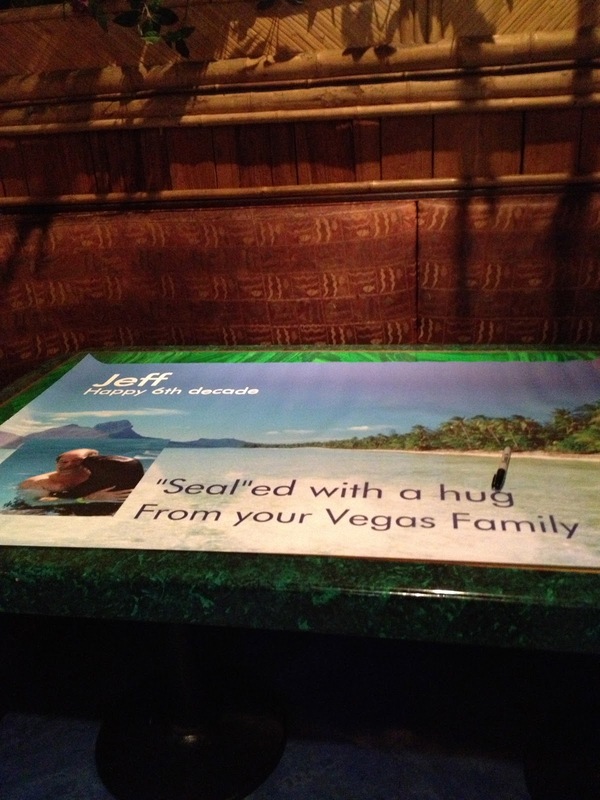 Below is the poster that party attendees could sign with birthday wishes for Lowrance. Barb, decorator extraordinaire! Barb and Ger had a incredible amount of Hawaiian decorations and birthday balloons to decorate the private party room with! 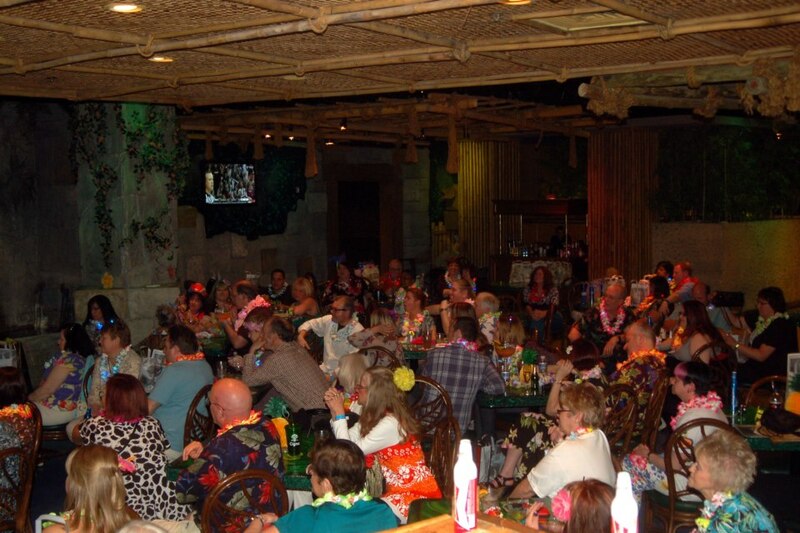 We had a huge private dining room in addition to a outside area that had been arranged by Teresa with Kahunaville months in advance and it was perfect!! Kahunaville really worked with T to make the space work for our group, including a mic and staging area for our roasters. Thanks again to all the employees at Kahunaville who helped make this party a success! 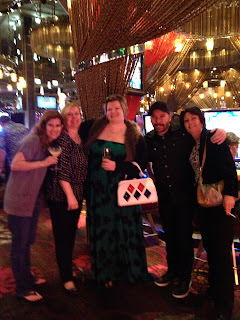 The painting of Lowrance above is a Gwen (yourstarla) original and everyone wanted to be photographed with it! That's Brian's Mom Tobi, Brian and his wife Sharon. Liz, Gwen, please watch where you put your hands! Et tu, Lisa and Troy? At the end of my trip I felt the above sentiment fit. 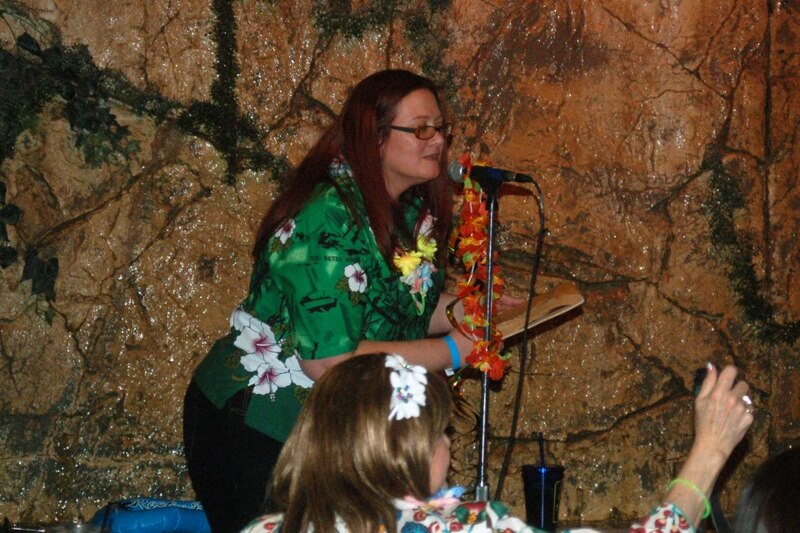 Katie with the other side of the container of the Big Kahuna drink! Bob and Sherrie, cute as always. 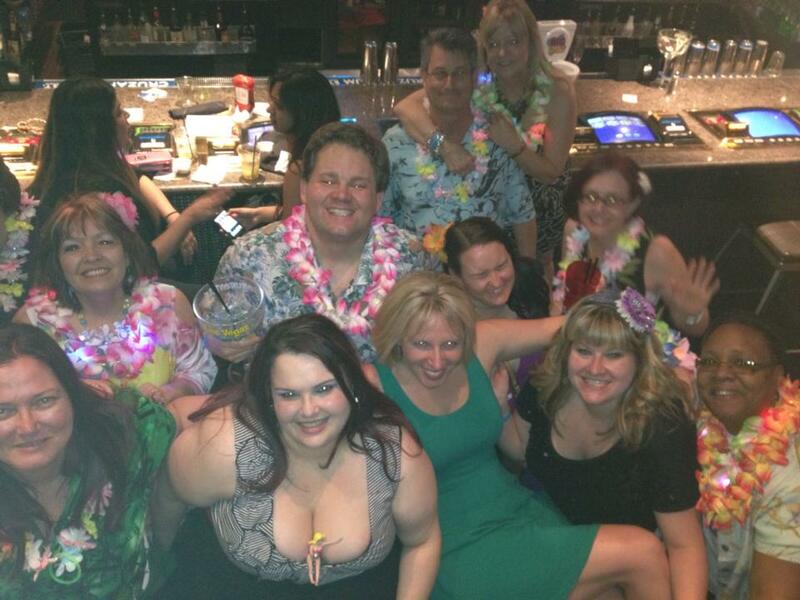 Love the coconut bra Bob! Greg and Shona looking good! Greg along with Dan was in charge of taking the cute tickets that were made up for all the party attendees. Liz and I were in charge of getting everyone lei'd. ;) Here we are with Manette between us. 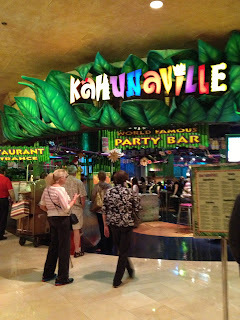 Manette by the way had also arranged a party at Kahunaville a year previously for the Slot Machine Forum Meet which was another fun party! 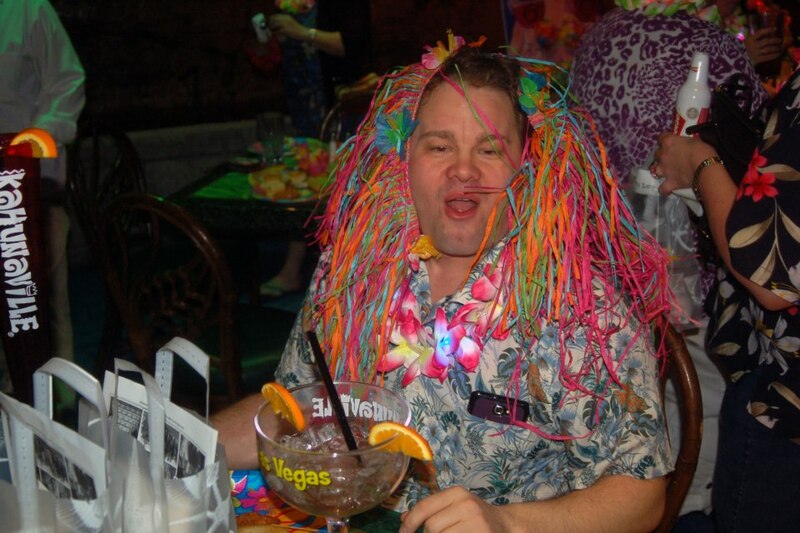 Our birthday guy is a two fisted drinker! Lowrance reliving a moment from the past, present and likely the future. Mr. TJ (John), has the best photos! 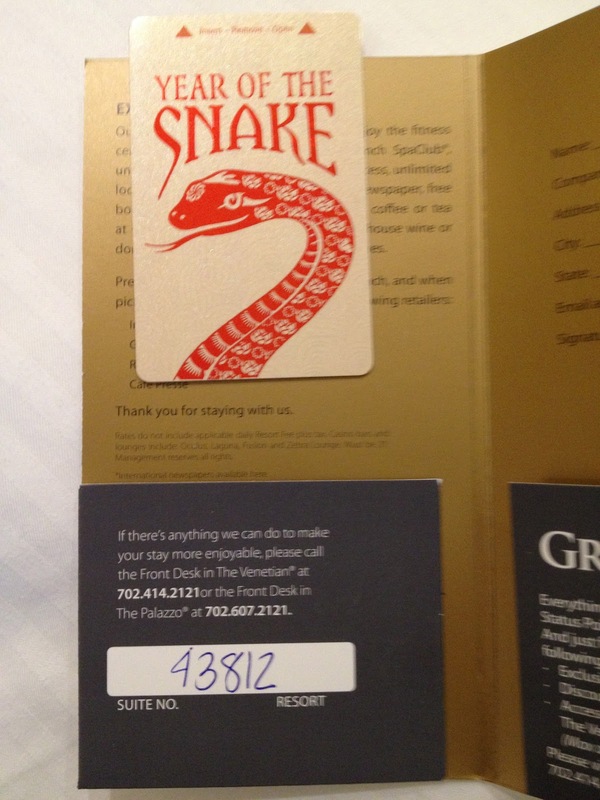 So I stole some with his permission of course for this trip report. John, thanks so much! 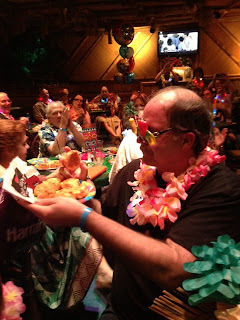 John also had a very unique gift for Lowrance. He put together a video to the song "Call Me Maybe", with clips of a bunch of us doing funny or cute things while lip syncing to it. 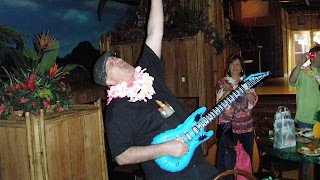 John gave all of us a copy of the CD and Kahunaville also put the video up on their television screens for us all to watch at the end of the party! 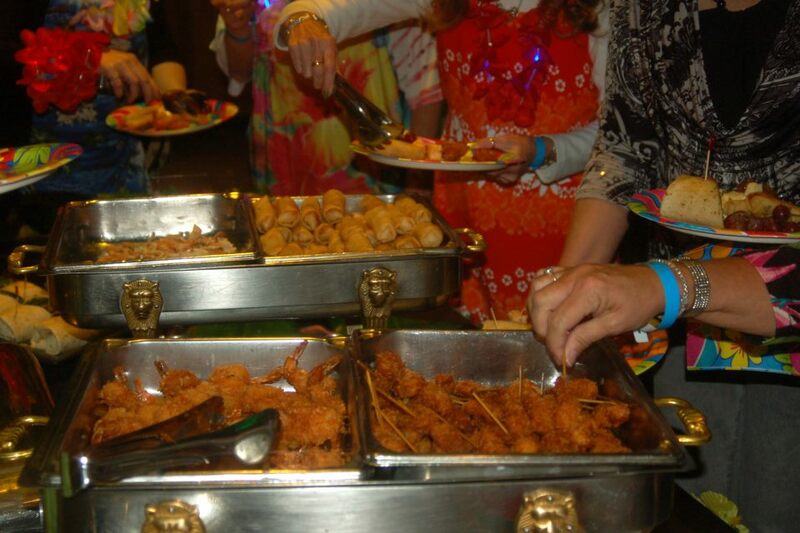 Above is just an example of some of the tasty food at the birthday party! 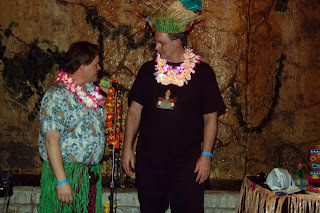 The main event at Lowrance's birthday party was the roast! Brian and Gwen were our joint Roast Masters and they were a riot and kept the party flowing smoothly, kudos to both of you! Lowrance after being crowned the Big Kahuna! 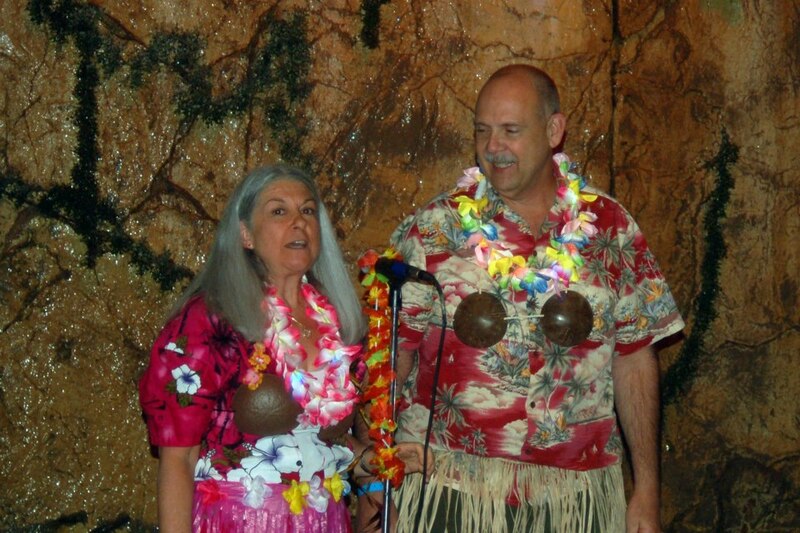 Brian and Gwen also had adornment for Lowrance's wife Roz. Have I mentioned that Roz and Lowrance are almost neighbors to me. We live about 15 minutes away from each other! Love you guys, lunch soon? 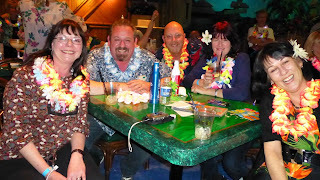 Gabby and her husband came all the way from the UK for this birthday celebration. Gabby is in a crab costume with Julie and her roast of Lowrance was a standing joke between them about a past trip in Vegas that involved crab legs. 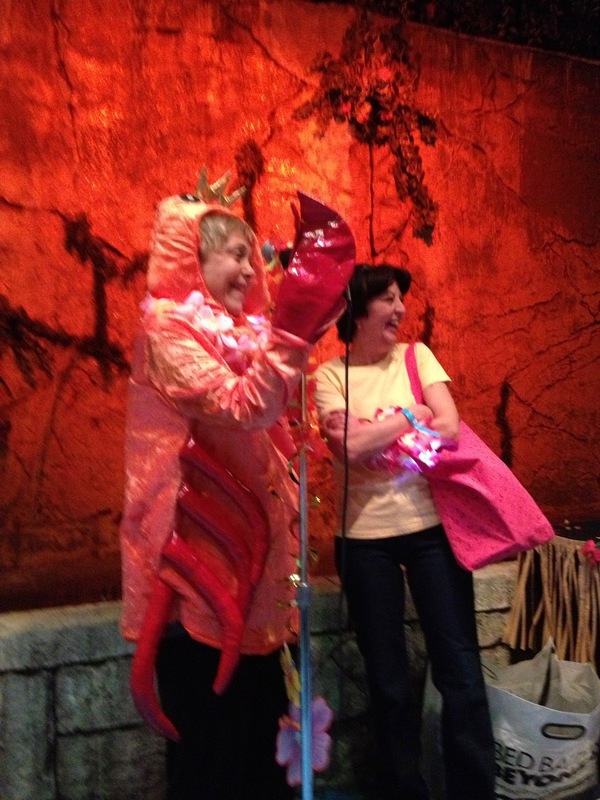 Shaunna knew Lowrance's love of Red Lobster Biscuits so she hand delivered them with Theresa while she led us in the Red Lobster Birthday song! 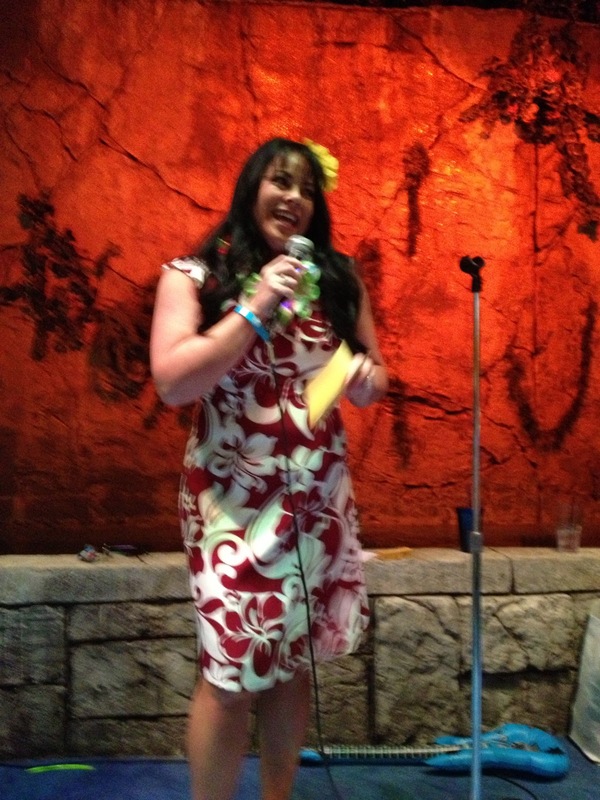 Unfortunately I was video taping the roast and didn't get a photo of Shaunna delivering the biscuits. Below is Jane (Foxy) Her roast even involved a phone call from a certain someone who couldn't be there. Oxygenator was one of the Roasters! His roast involved something called Sir Farts a Lot Hot Sauce! 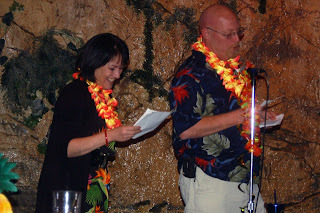 Trish and Dan had a hilarious multilingual routine. Sheri another roaster giving Lowrance his bag from Publix supermarket. Lowrance calls Publix something else but I'll let you guess what that is, or if you are a bad guesser just substitute a c for the x in Publix and subtract the L.
Stepahnie cracked me up with her eulogy to Lowrance and her 23rd psalm reading with photos! Teresa took us back in time to the year of Lowrance's birth 1953 and the way it was, and ended with a heartfelt tribute to him that had herself and many of us tearful! 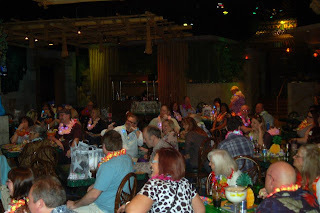 Can you tell everyone was having a great time? 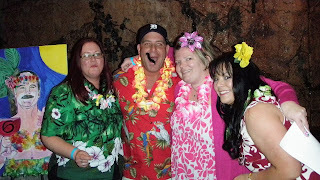 Moi, Sherrie, Shannon and Shona! Below a view of part of the party scene. 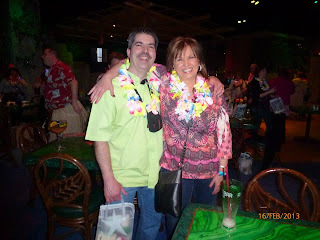 Gina and Paul, a fun couple! 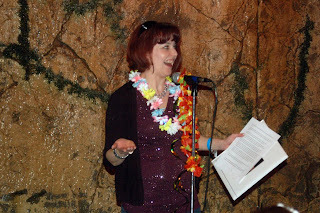 Gina will always be the disco queen to me from Teresa's 40th themed birthday party which was at Kahunaville (of course)! It's time for Lowrance to blow out the candles on the ice cream cake! The rest of us had delicious cupcakes! Note the cute cupcake toppers that Teresa made by hand. Sylvana came all the way from Australia for Lowrance's birthday. 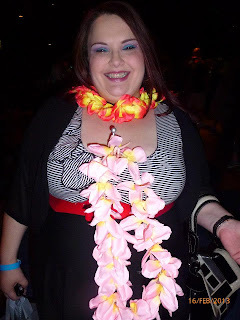 Lola, the stripper doll that has epic adventures was in attendance wearing her own lei and was very comfy resting on Sylvana! Anne-Lise, Jon, Sharon and Dana! Lowrance reliving another past and present moment! 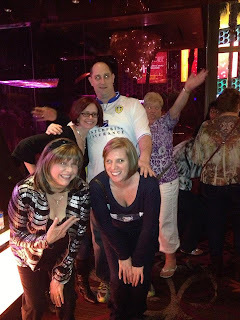 Jane, Brian, Gwen and Teresa, all of you rock! 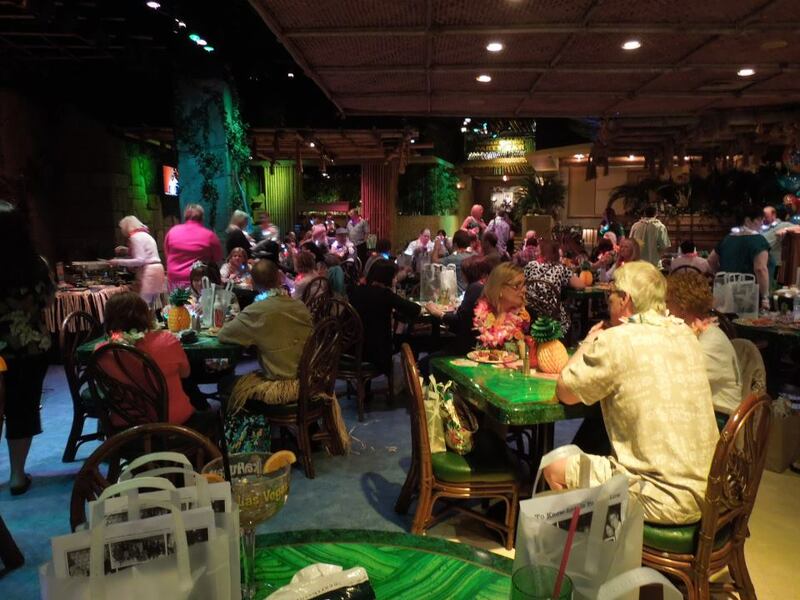 Another view of the party room. We had to depart our party room at 4pm so a large part of our group continued the party in the main bar area of Kahunaville while others cleaned up and went back to our hotels to rest up for the party at Bond Bar. 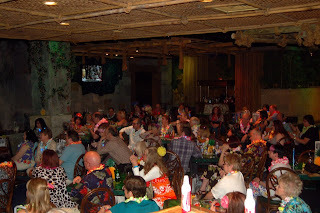 Below part of the group that stayed for a while and obviously continued to have a great time at Kahunaville. Back at Palazzo I had a few hours before meeting up with friends to go to Bond Bar that evening where the partying would continue. During this time I found out that Randy was safe at home now but had lost more to the slots before leaving for the airpot and while I tried a few slots on my way to my room to rest up, all I had was losses too. 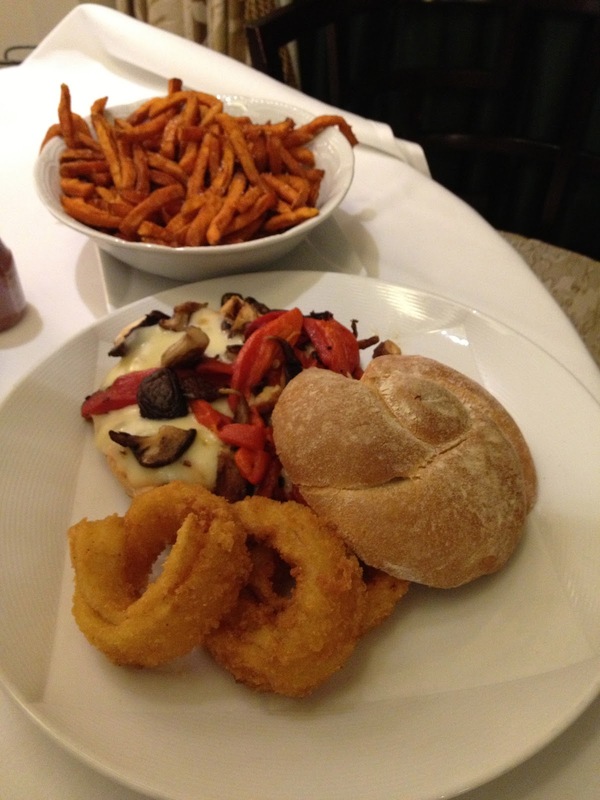 After a rest, I ordered dinner from room service. That's the grilled chicken sandwich with wild mushrooms, roasted red peppers and provolone cheese. 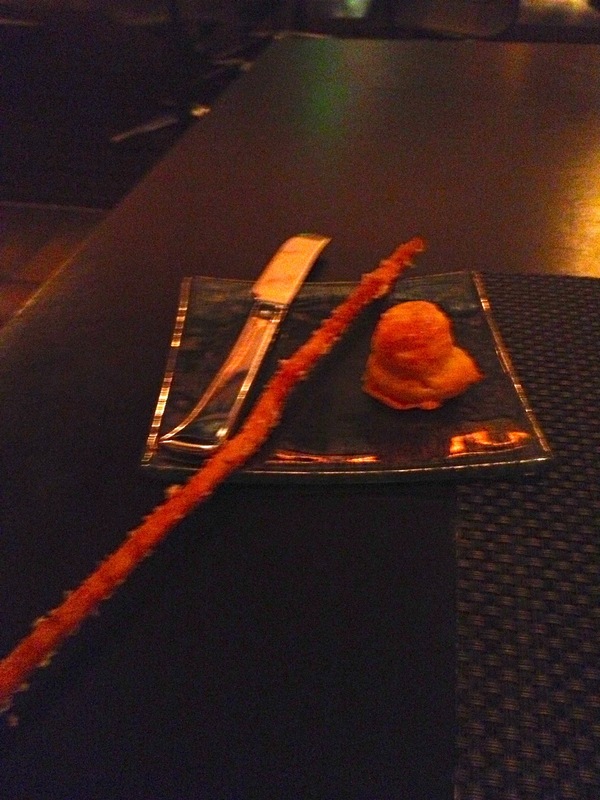 I ate it without the bread but got my carb fix from the sweet potato fries that came with it. 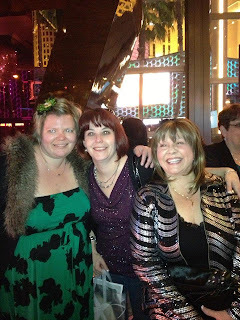 Gwen, Liz, Teresa and I arrived at Bond Bar a bit after 9pm and the party was in full swing. 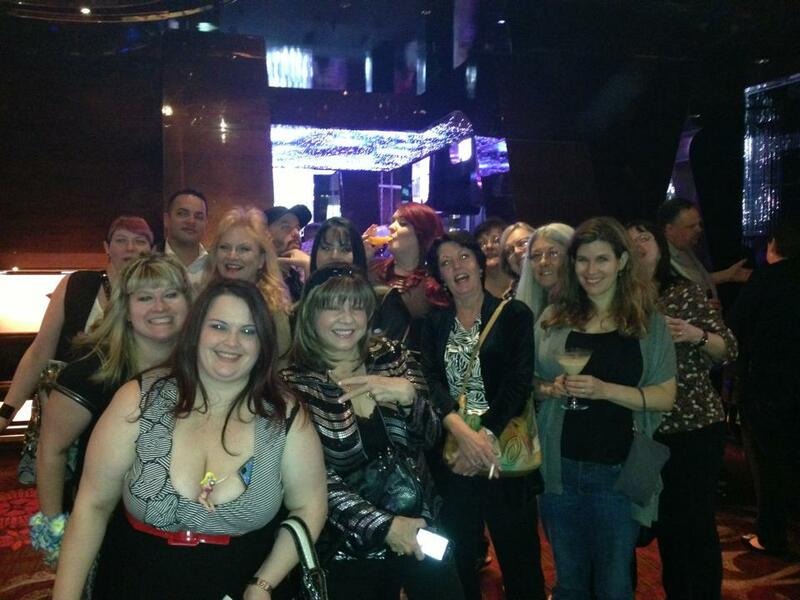 We took over one side of Bond Bar and then spilled out into part of the casino. 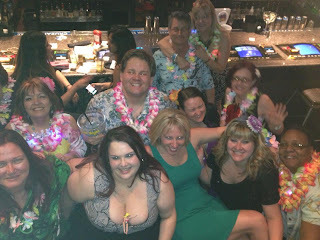 Some of us starting dancing to the music including Jen and I who were going down low like for the limbo with the result that I lost my balance when going back up and fell to the floor. As I was getting up unhurt and laughing at myself Carol flew out of nowhere and landed on me! Love you Carol! Below, having fun and keeping a eye out for Carol. That's me, Shannon, Lisa D, Greg and Carol. 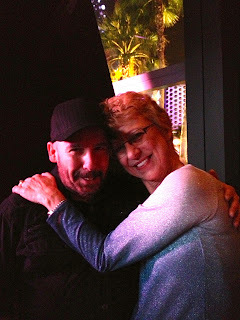 Below are buddies Jon and Barb! 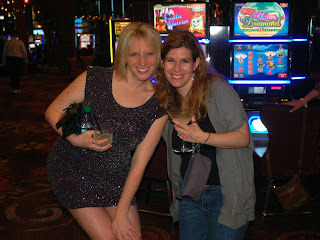 Katie and Jen, looking good ladies! 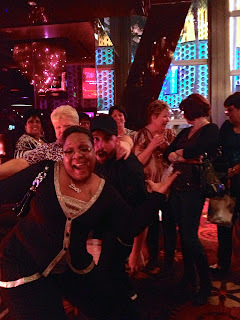 It's a blur at this point what we were doing but fun happens when you coax Carol out of her beloved Harrah's! 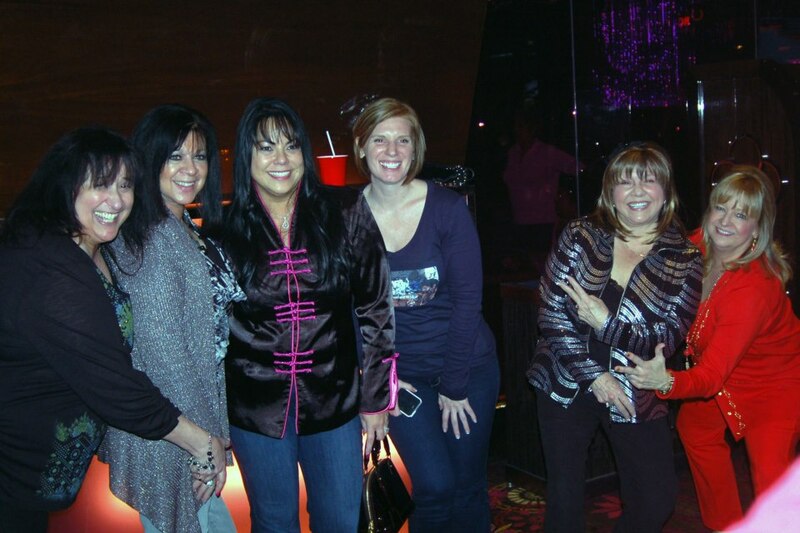 Roz, Vinette, Teresa, Shannon, me and Teri (Texas TJ)! We're still rocking and having fun! 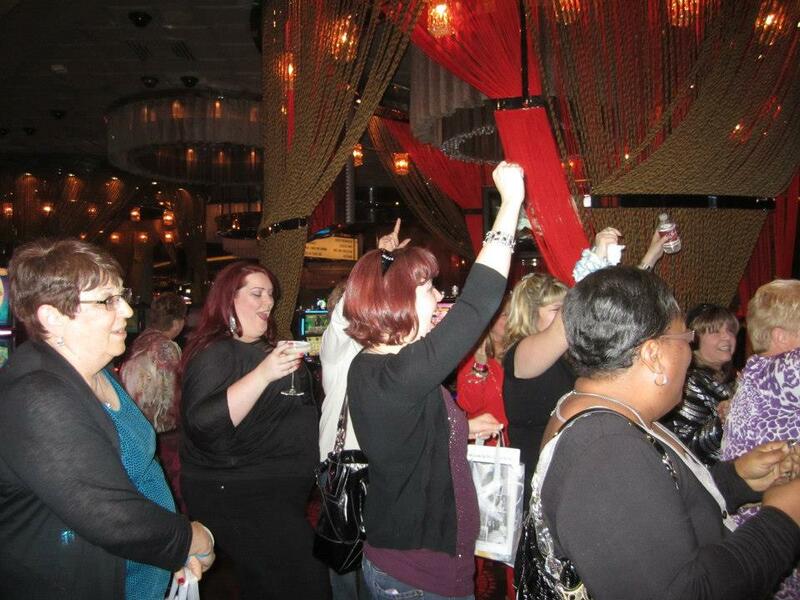 Shaunna gets her groove on. 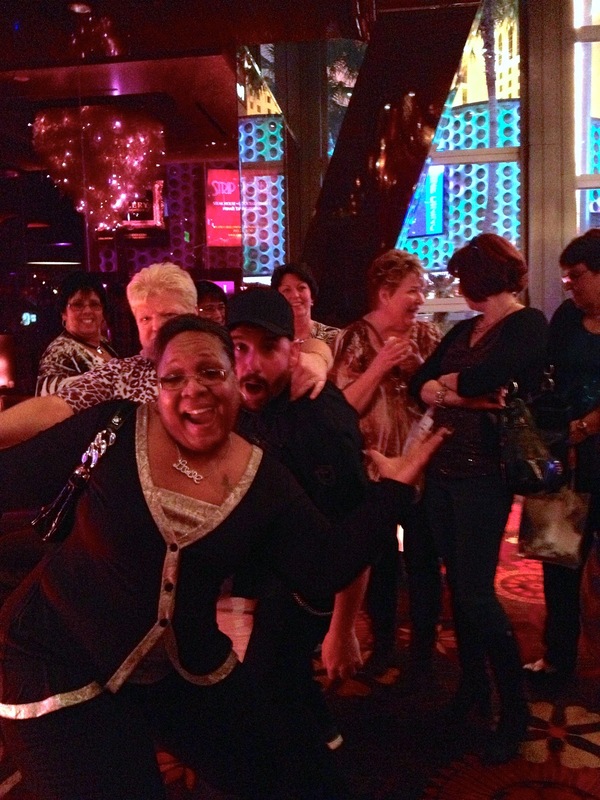 Watch out that's Carol behind you! Gwen and I were tired so we left Bond Bar while the party was still going strong and we went to Palazzo where we had a quick stop at the Platinum lounge after which Gwen headed back to Wynn. 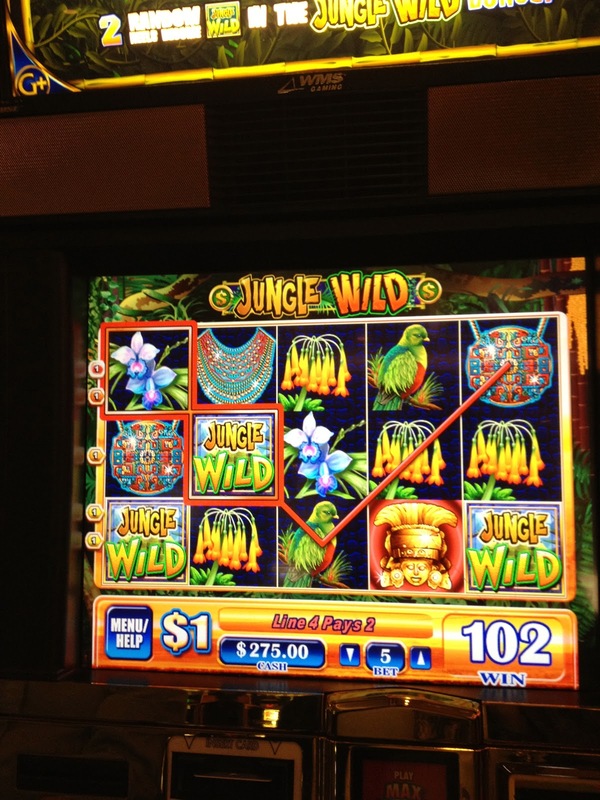 On my way to my room I played a few slots and continued to lose. It was time to get some sleep and hope for better luck in the days to come. The last part of my trip report covers 4 nights, three at Wynn and one at Aria and will be finished in a few days! 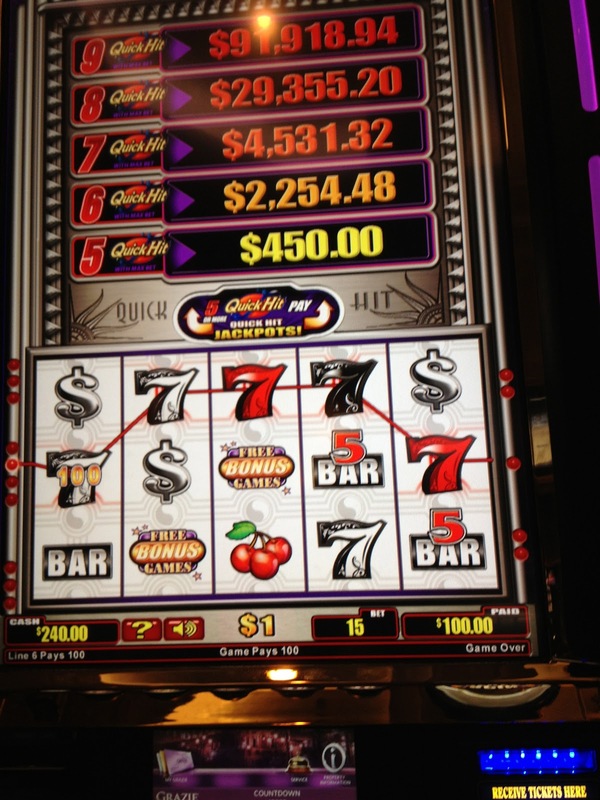 The fun continues with a great family dinner at Casa di Amore and dancing to the Vegas Limit at Mandalay Bay! 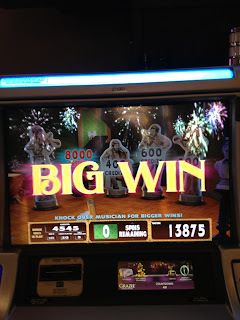 Thanks again to John, Lisa M and whoever else I might have borrowed photos from! I really enjoyed reading your TR as usual, Diana. It's amazing how you remember so much and in such great detail!! 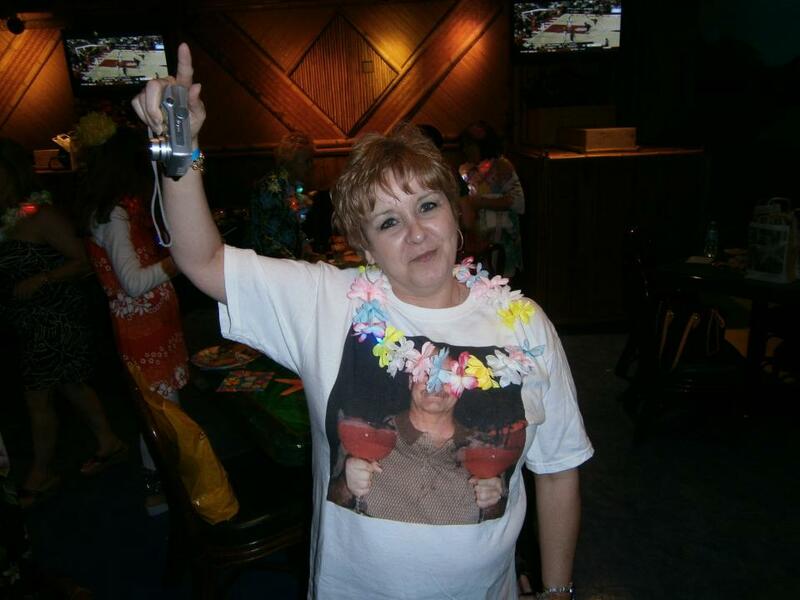 You are such a fun lady, and you have a heart of gold. Randy is pretty cool, too!! Looking forward to Part Two!!! Thanks Lisa. Same back at you, sorry this time we didn't get to spend more time together. I'm loving my "Bad Lowrance Dive Bar Extravaganza cup sleeve and coasters! Thanks John, I agree it was a awesome party. 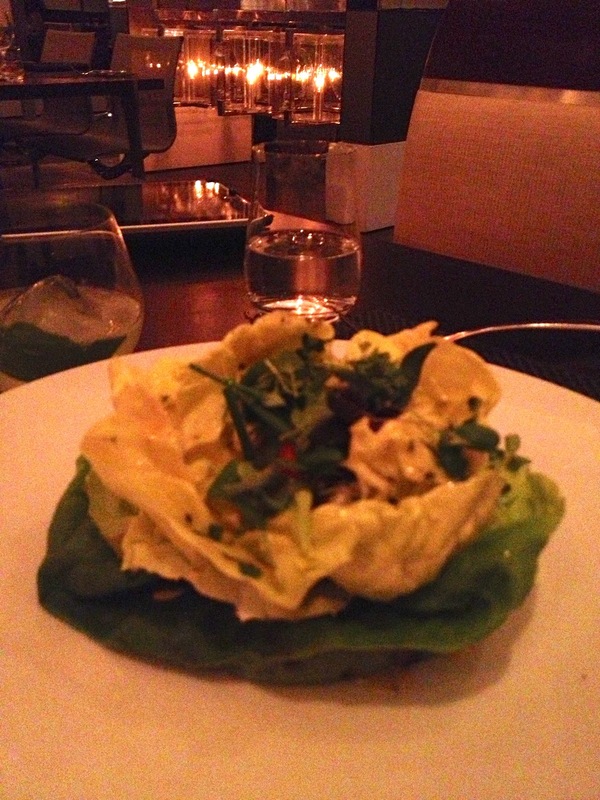 My photos are never as good as yours and you were right about I should have put the flash on the Iphone at Bond Bar. :) Still watching and getting a laugh out of the Call me CD you put together! Thanks for the review and great pictures from Cut. 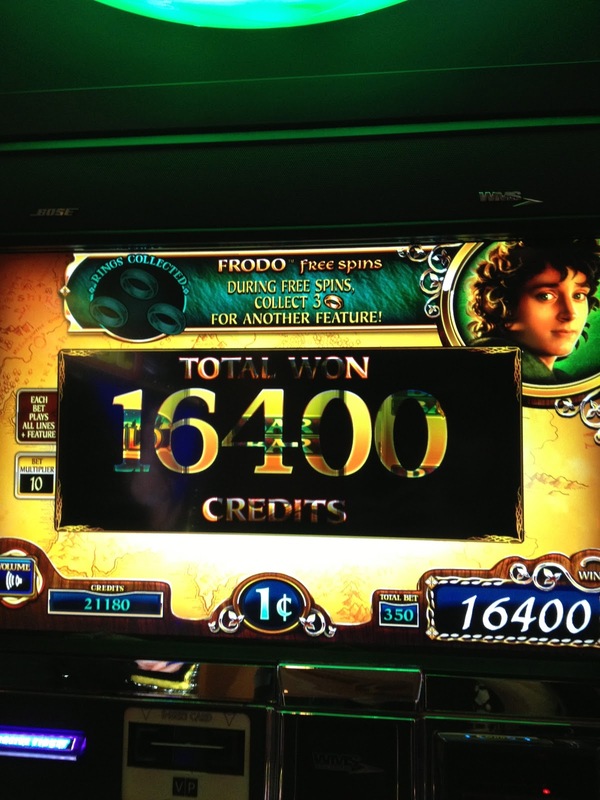 I agree about hitting a bonus and getting at least a consolation prize. 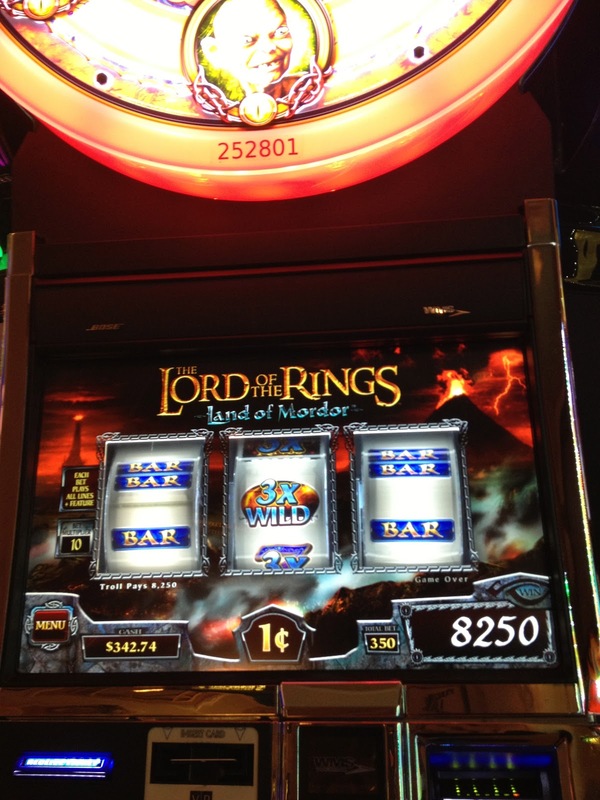 LOTR is one of my favorites now, but I do have to say that the multiplier bonuses on that can sometimes leave you frustrated! 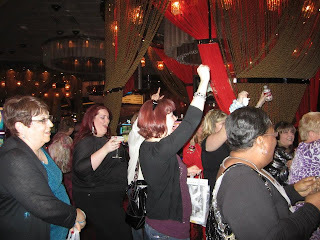 Nice report and pics on the party. It looks like it was a lot of fun! Looking forward to the second installment! Diana, as always, loving your recaps! 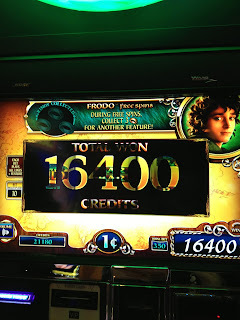 Thanks Shorelinepaws, I mostly get zero bonuses from the multiplier bonus on LOTR except for lucky trip back in August where I got a handpay for it at Mandalay Bay, so I'm not usually holding my breath on that one, LOL. 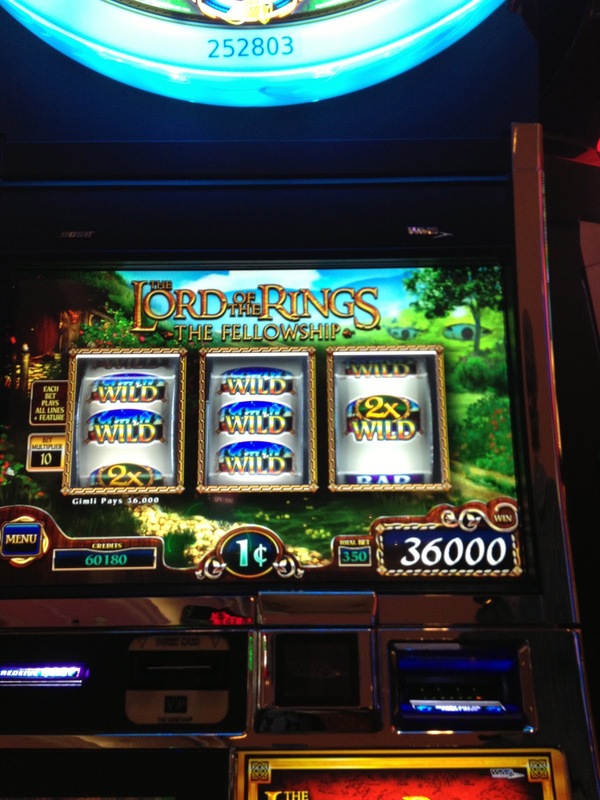 Lately the Legolas Arrow bonus has been naughty and giving me zero bonuses too. 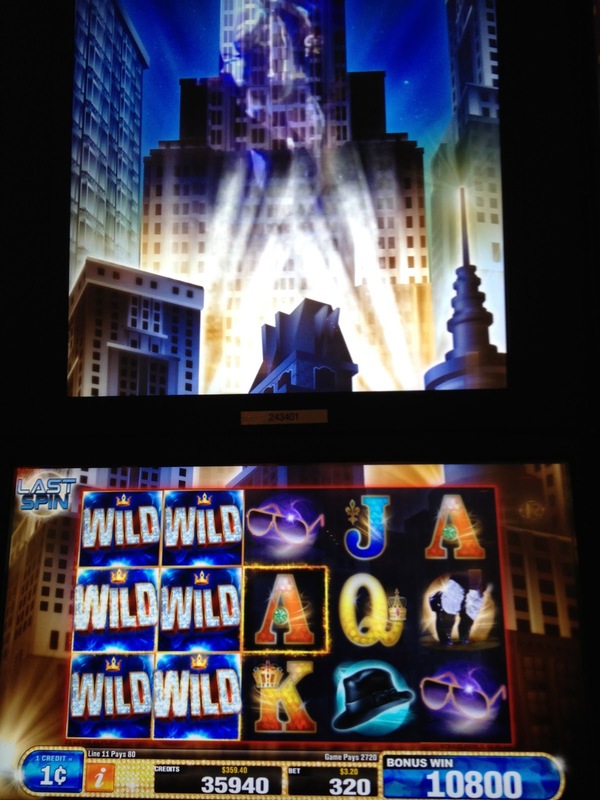 Mirage one bedroom tower suite via MyVegas!